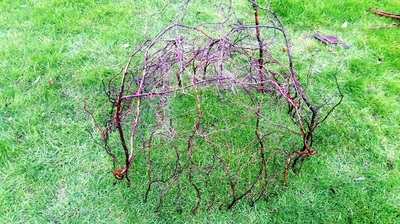 I often find myself contemplating how we experience space, place, and landscape. How do we exist and move in it? 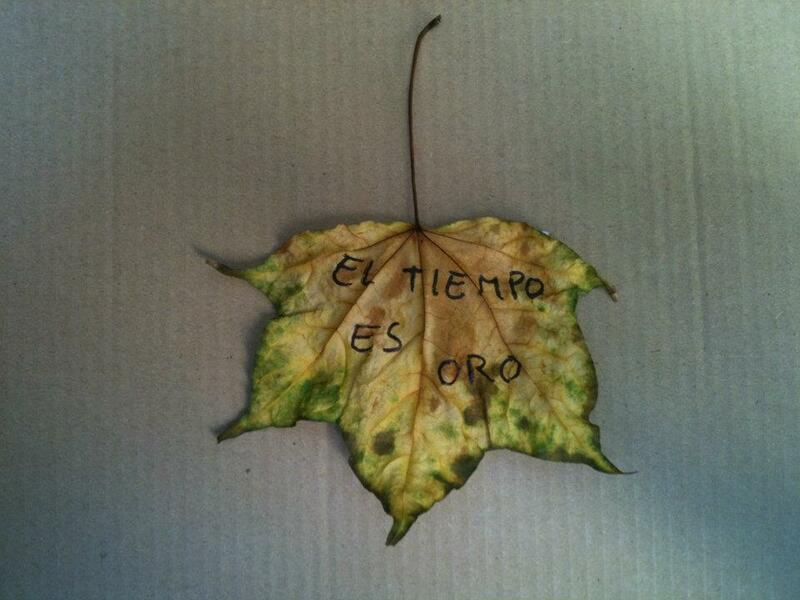 How do we relate to it? These 'land pieces' are private experiments. 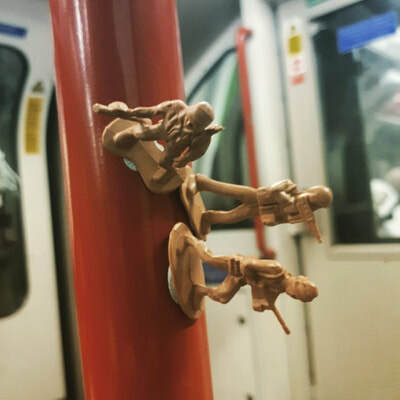 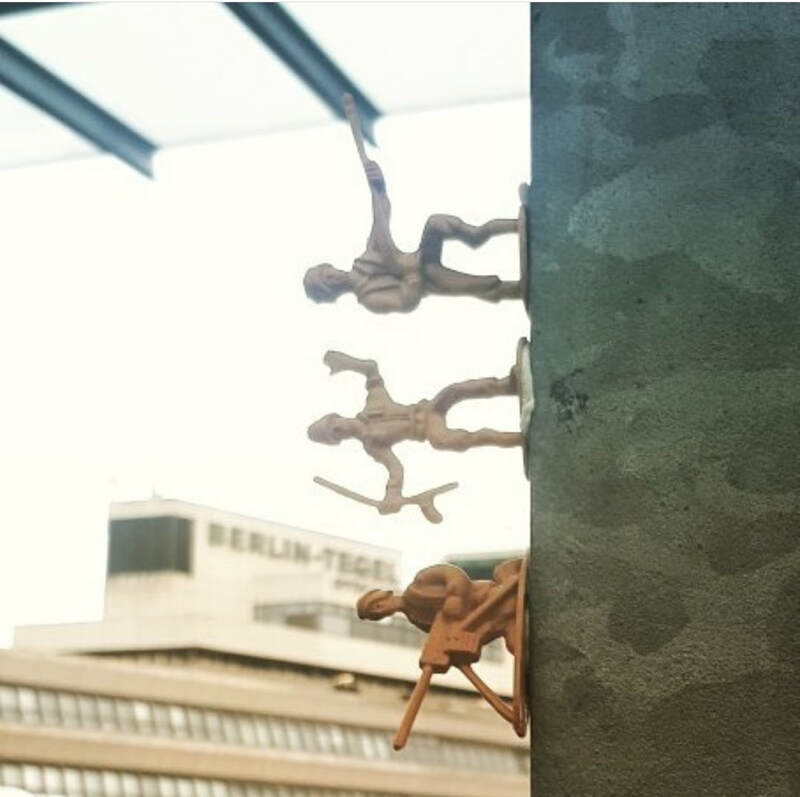 I started making them in 2010 as a spur of the moment action. Though they are always the result of a performative gesture, they're fundamentally installations in the landscape. 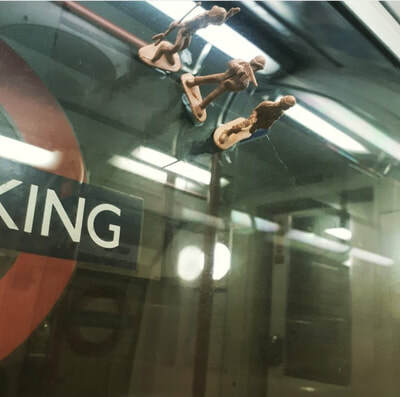 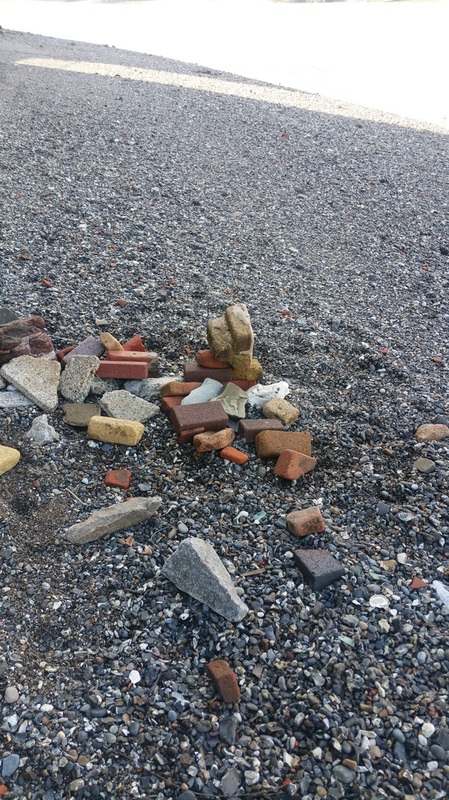 Conceived as ephemeral interventions, the materials used are always 'poor' or found Due to their often on-the-go nature, they're all documented using a mobile phone. 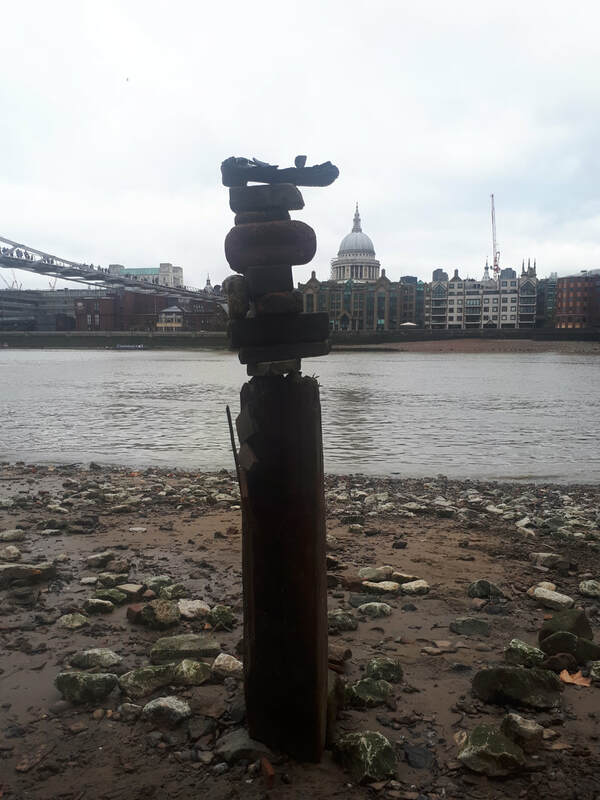 Site, place and space have also been important constants in my practice as part of Accidental Collective; which regularly engaged with notions of place, site-specificity and/or site-responsivity. 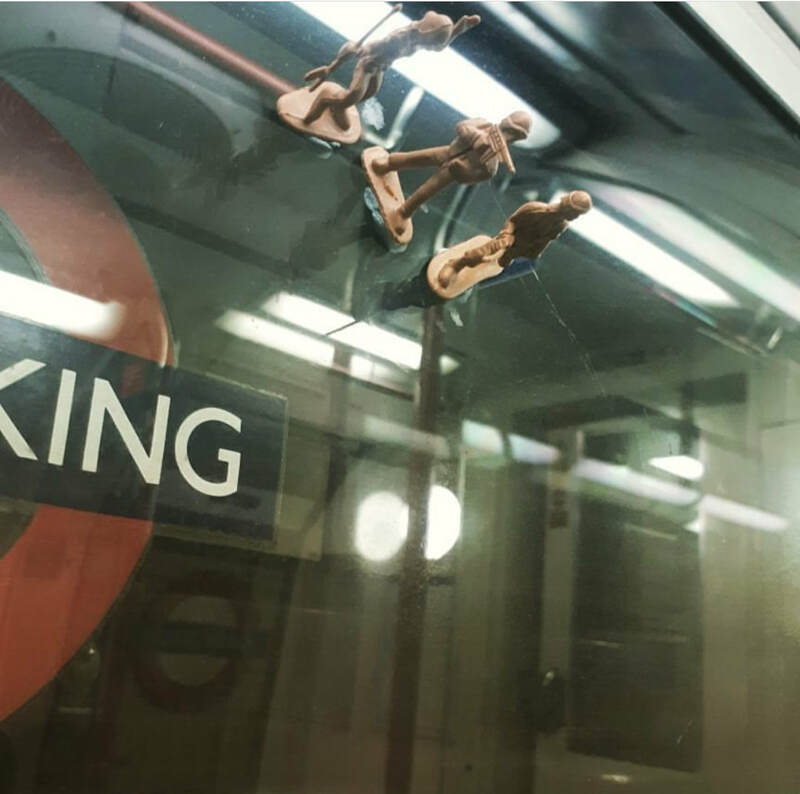 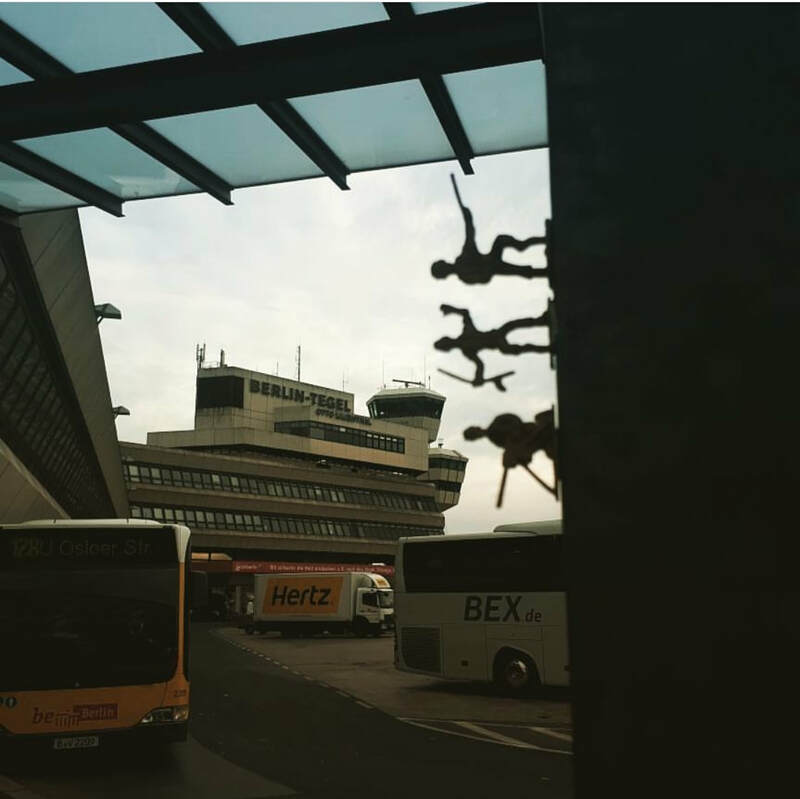 Our work has often taken place in non-theatre spaces such as bars, government buildings, beaches, city centres, shop windows, and even a football stadium. I began this now ongoing work on October 4th 2017, on my arrival in Barcelona. 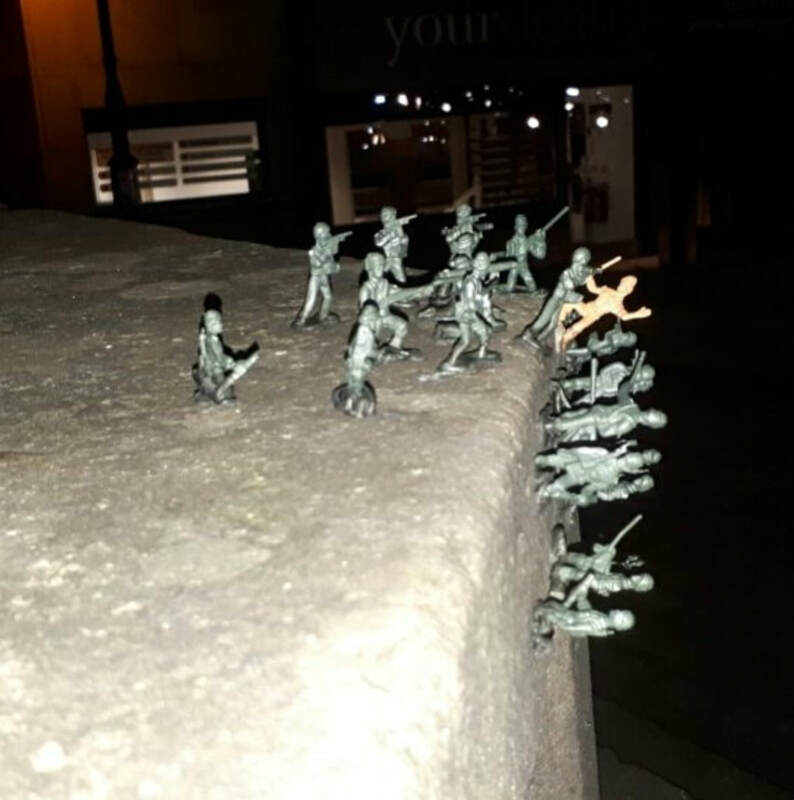 I was there on an impromptu art-activism visit in response to the events surrounding the Catalan independence referendum. The images of police brutality reaching me via my laptop in my kitchen in Birmingham had left me speechless, and then propelled me into action. 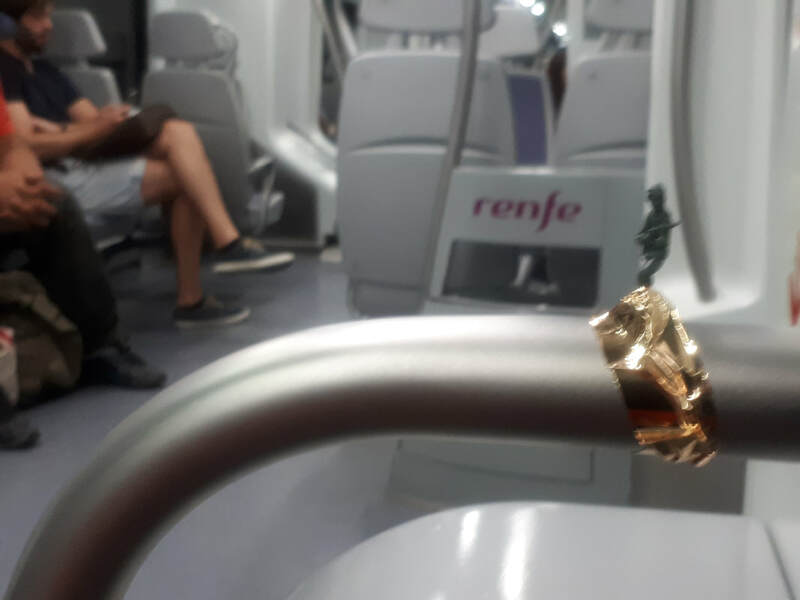 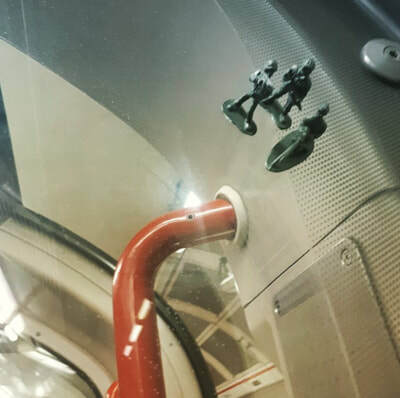 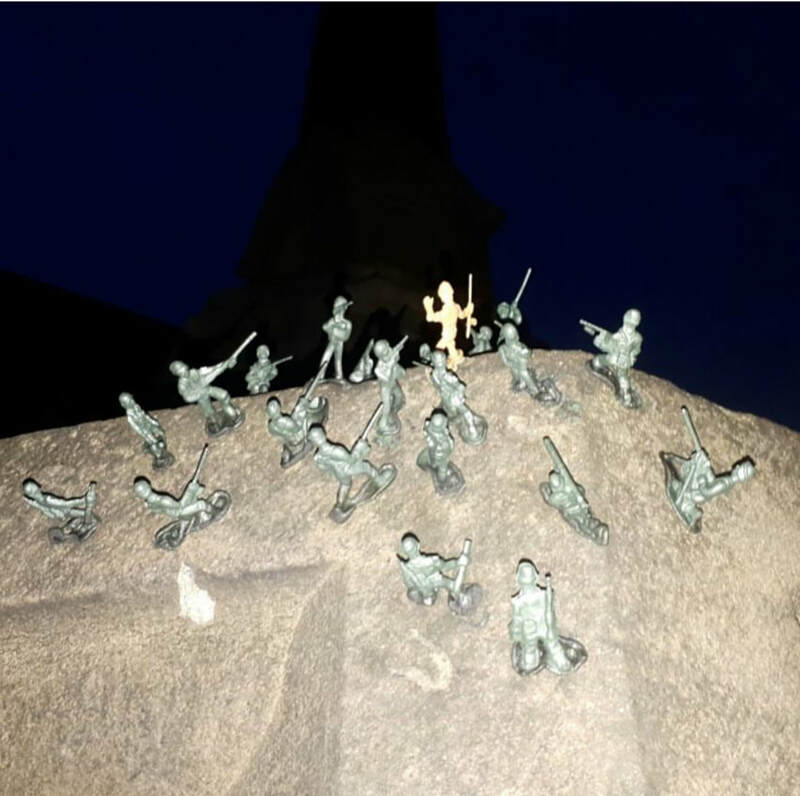 I hurriedly packed a back with performance stuff and got on a flight, Knowing that Guardia Civil troops and Police reinforcements were deployed across Catalonia in large numbers, I had made sure to take the bag of plastic toy soldiers. 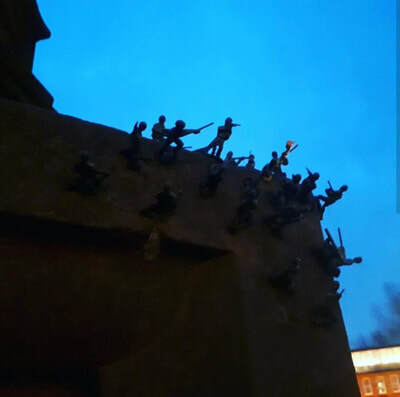 The arrangement of soldiers became am oxymoronically subversive gesture. Assertive and absurd. 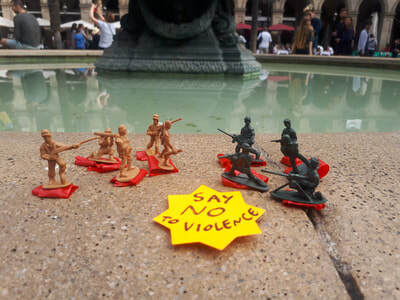 Playfully political. 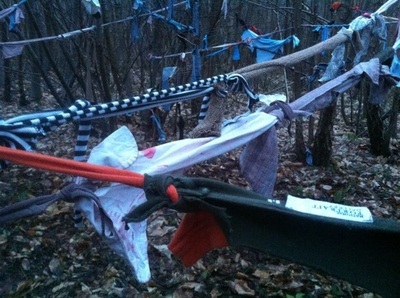 Violent and Vulnerable. 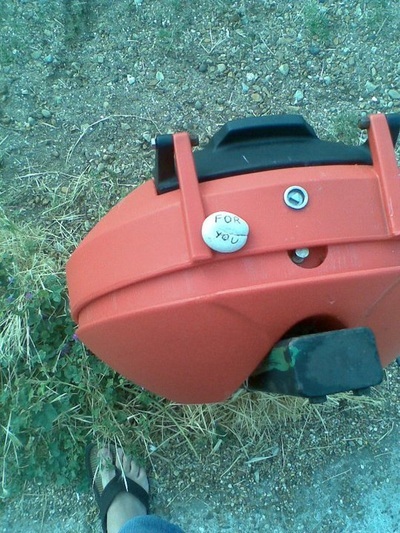 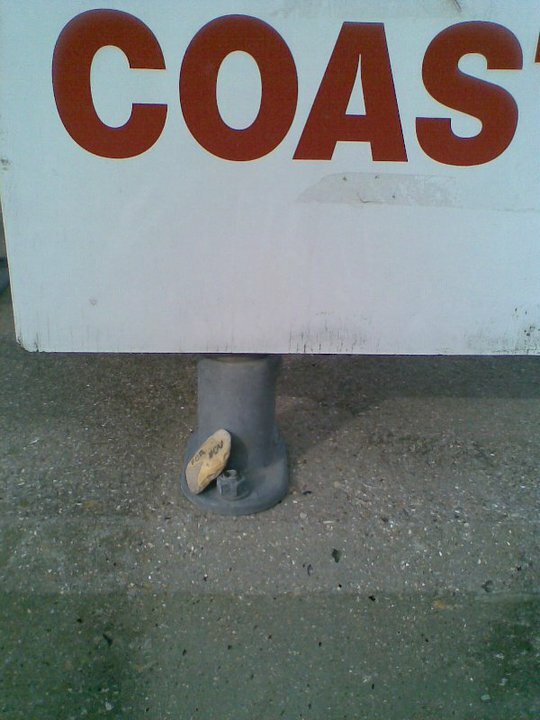 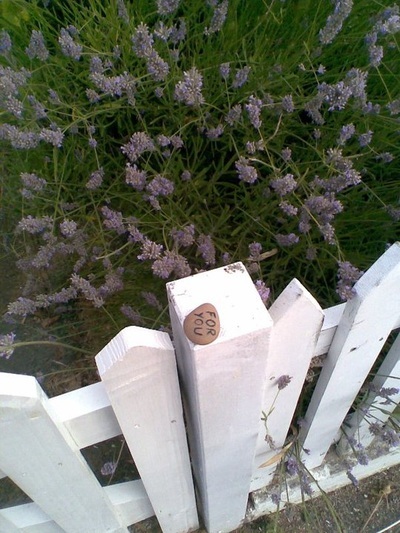 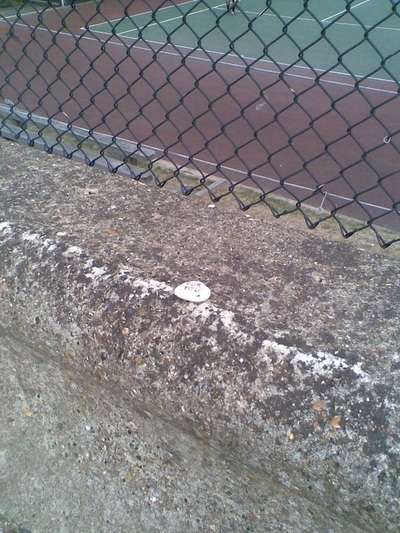 This urban intervention is the first 'land piece' where I don't use found objects. 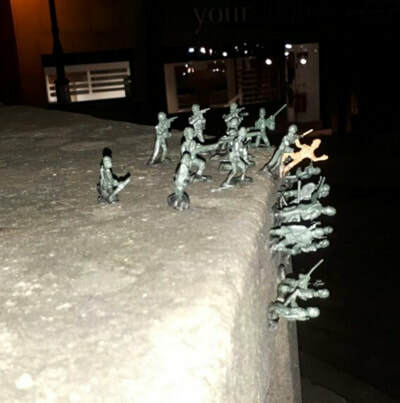 Instead, since the soldiers are merely blue-tacked, these temporary arrangements are at the mercy of the public. 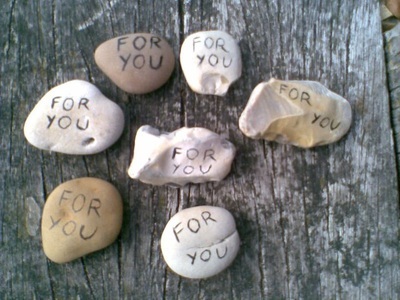 It is them who are the erosive force. 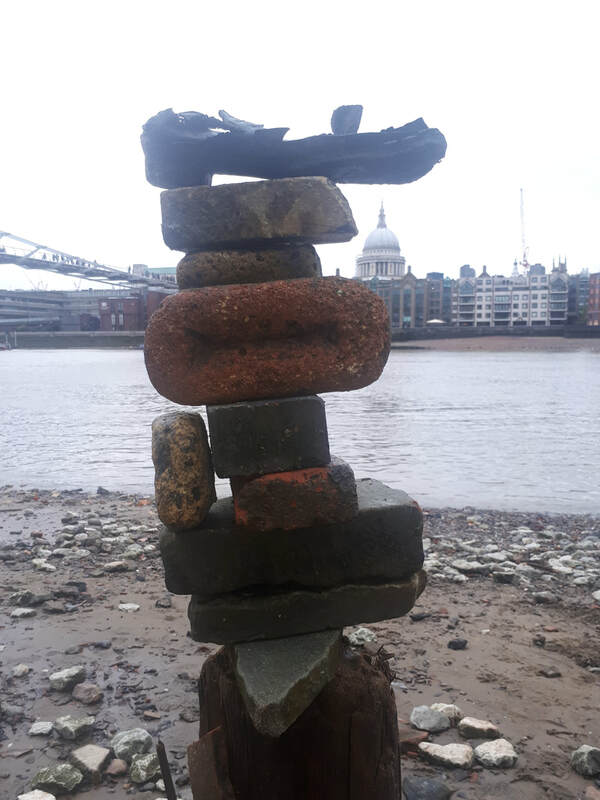 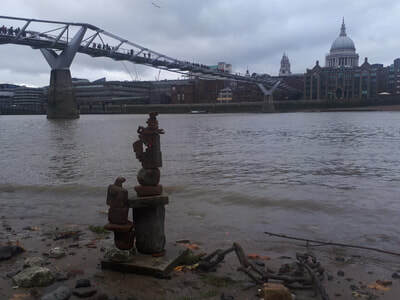 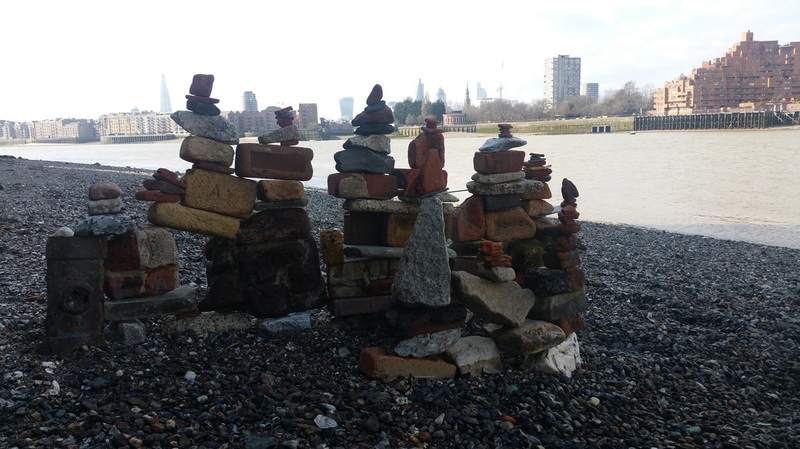 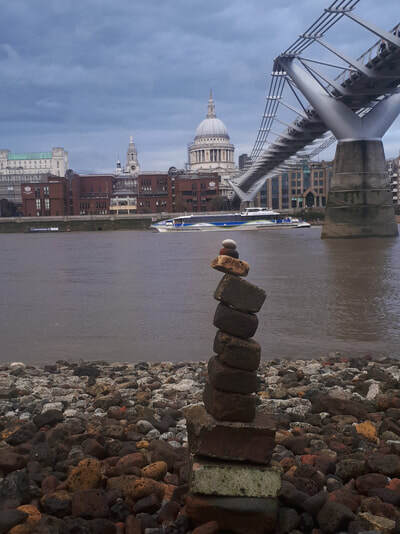 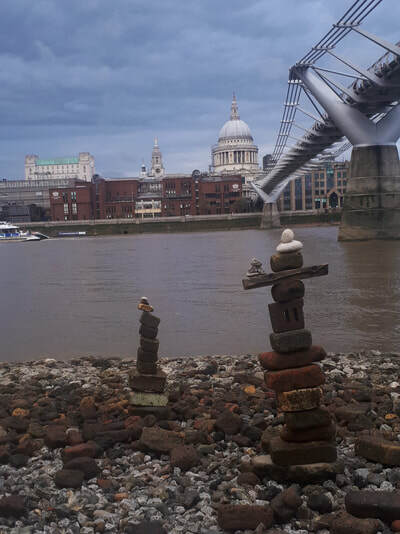 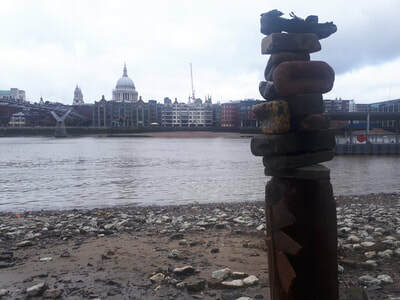 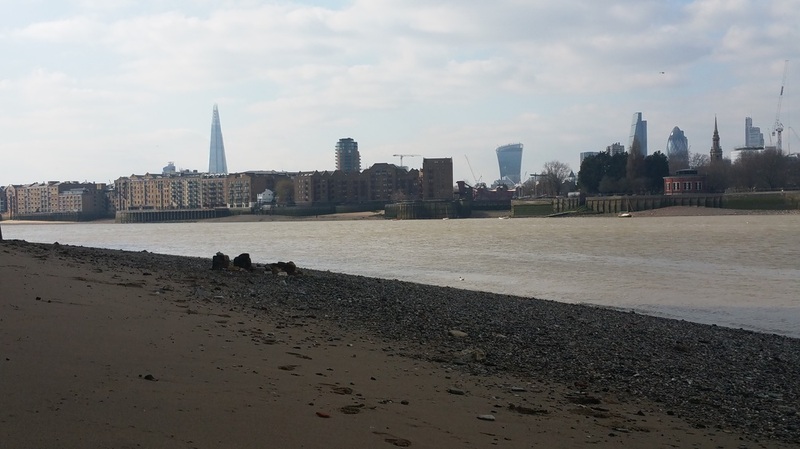 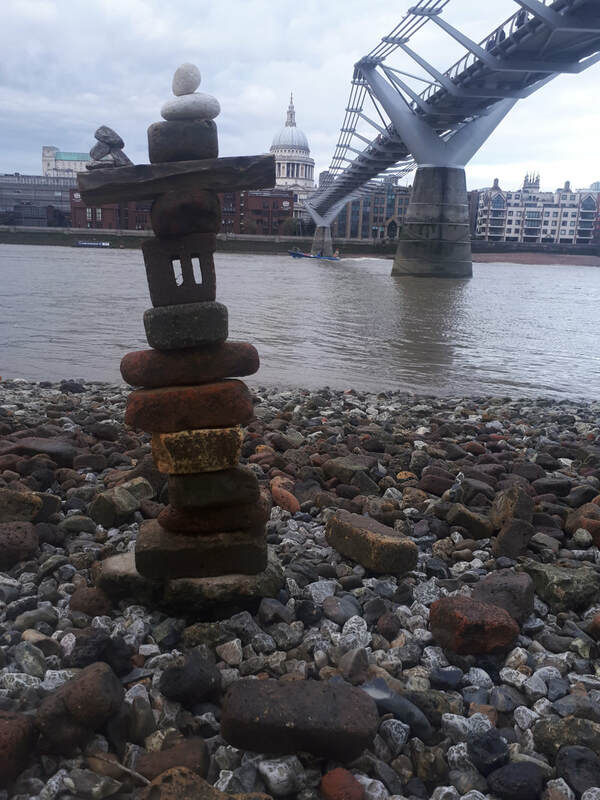 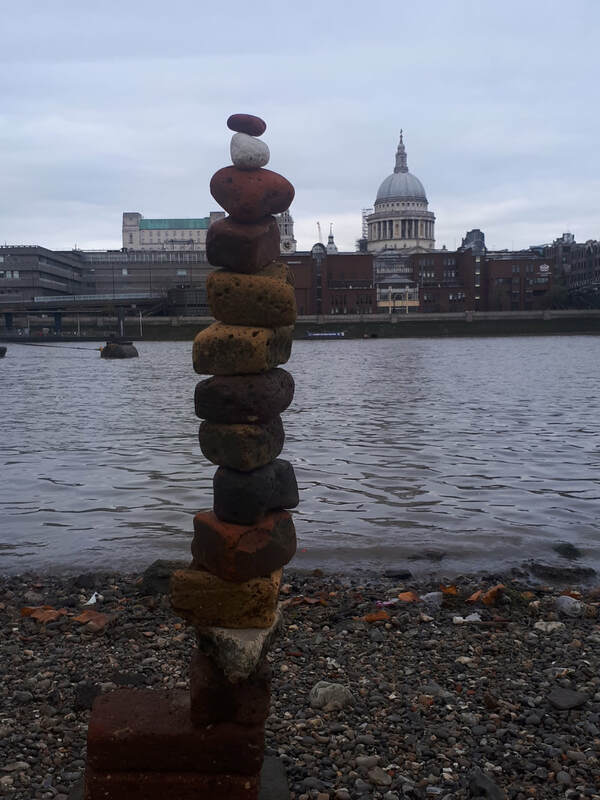 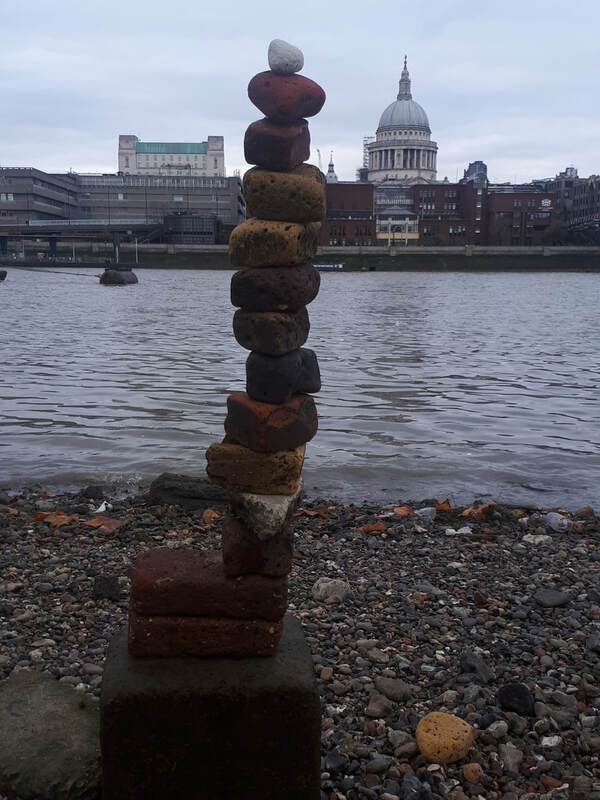 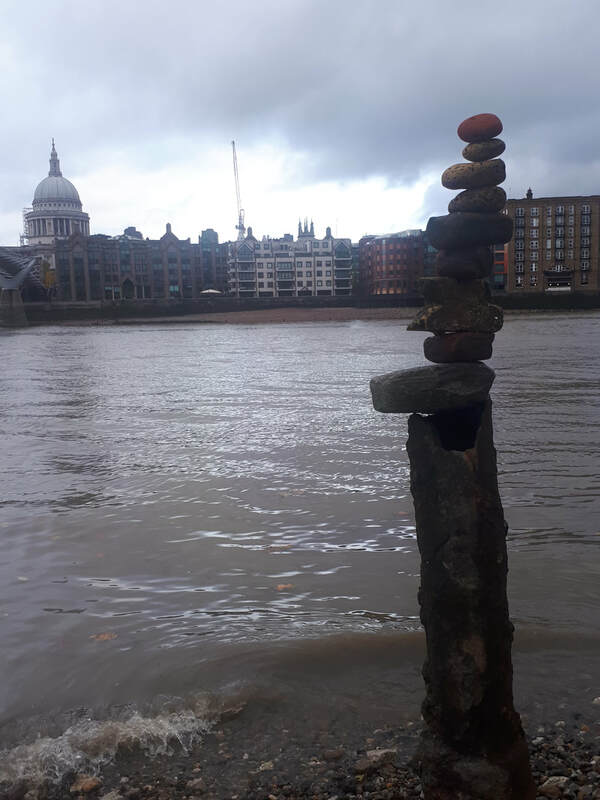 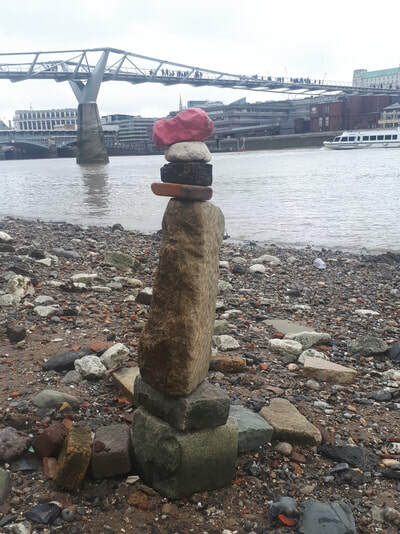 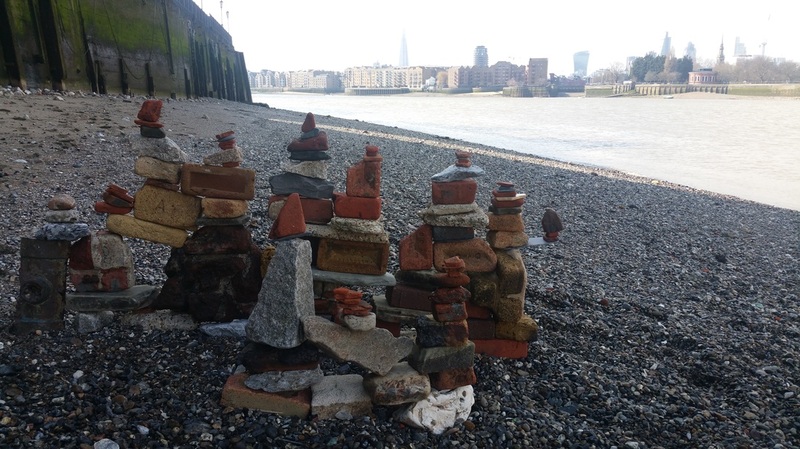 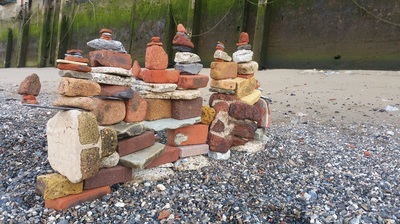 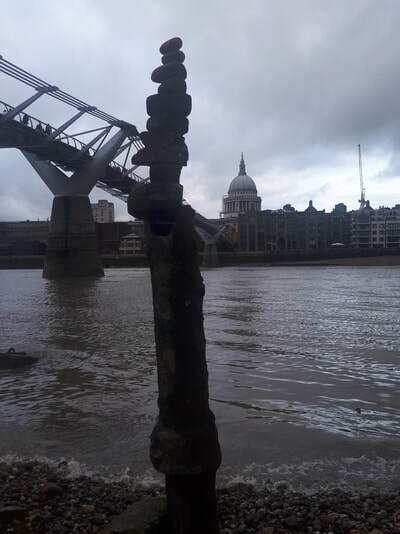 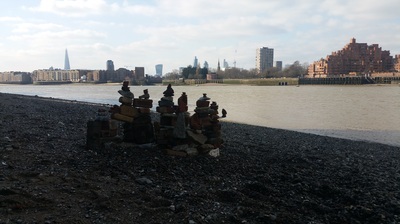 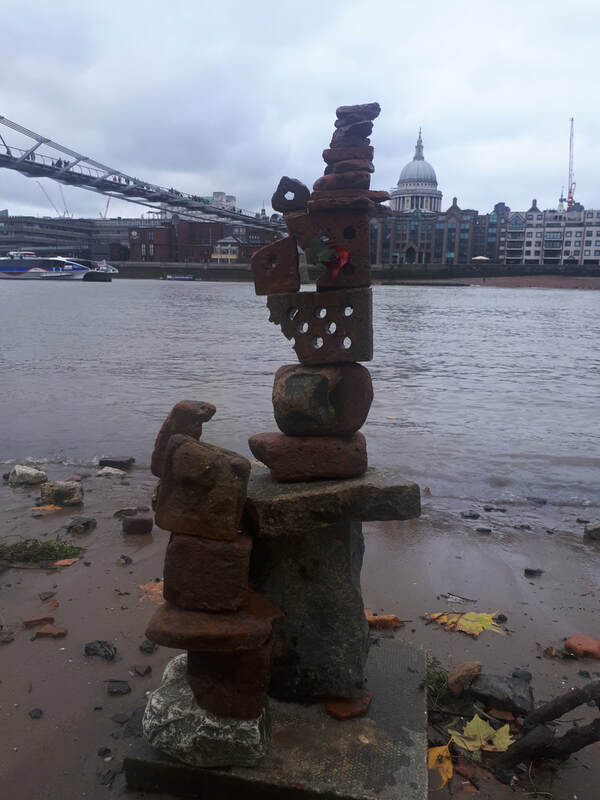 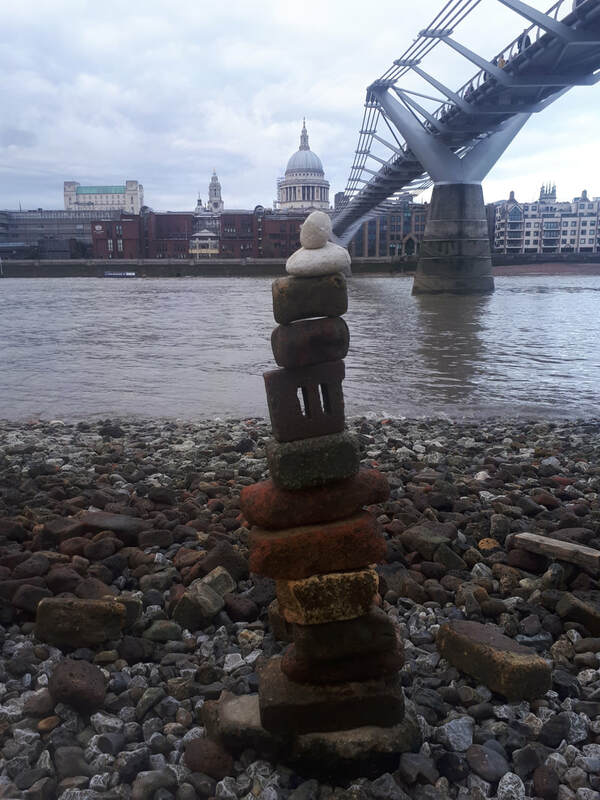 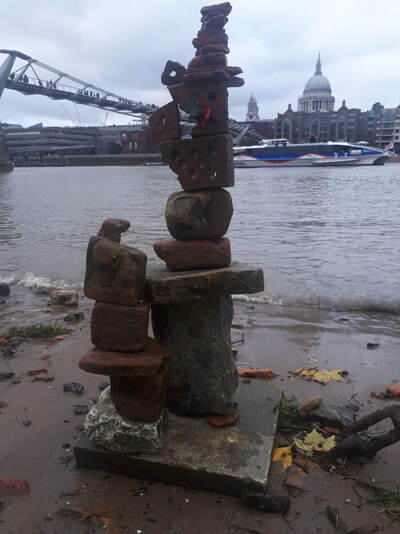 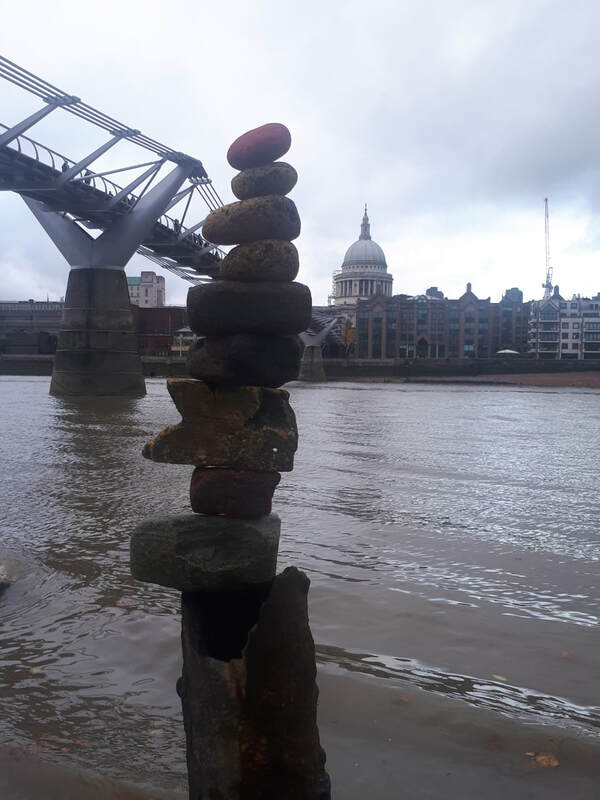 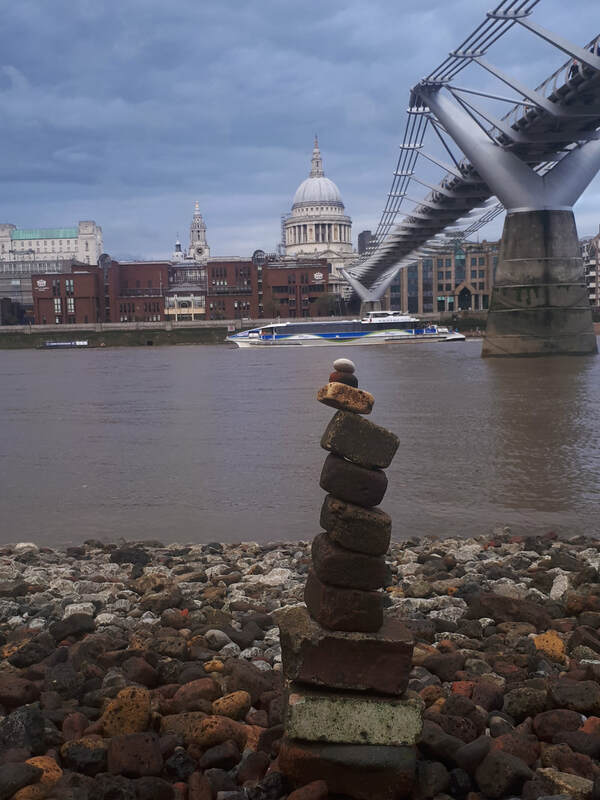 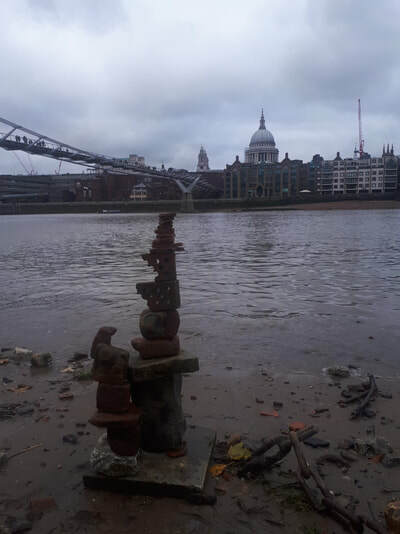 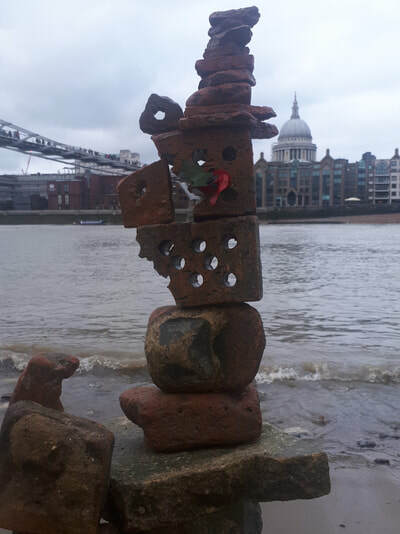 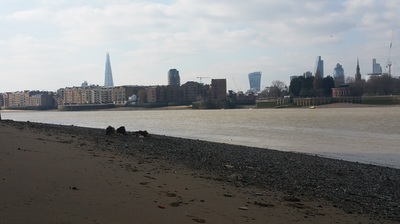 This temporary structure was erected using detritus washed up on the Thames south riverbank during low tide (after three attempts which ended in collapse). With the City of London as its background, it stood for only 10 minutes. 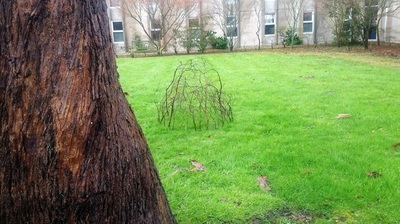 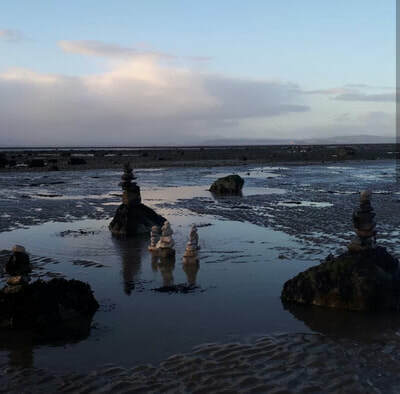 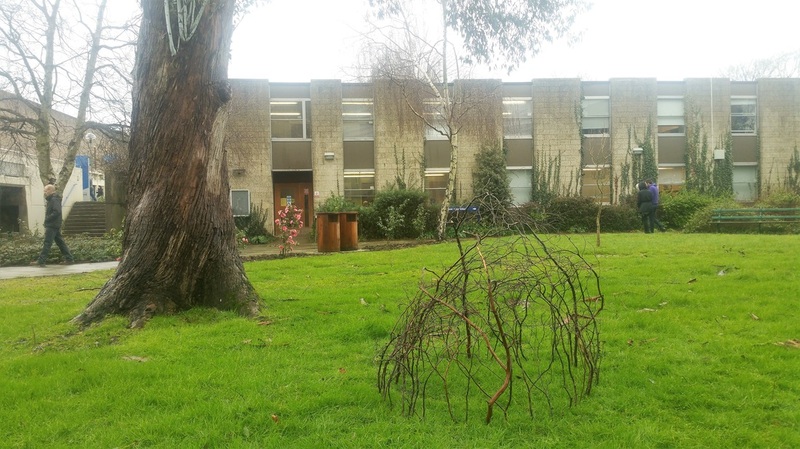 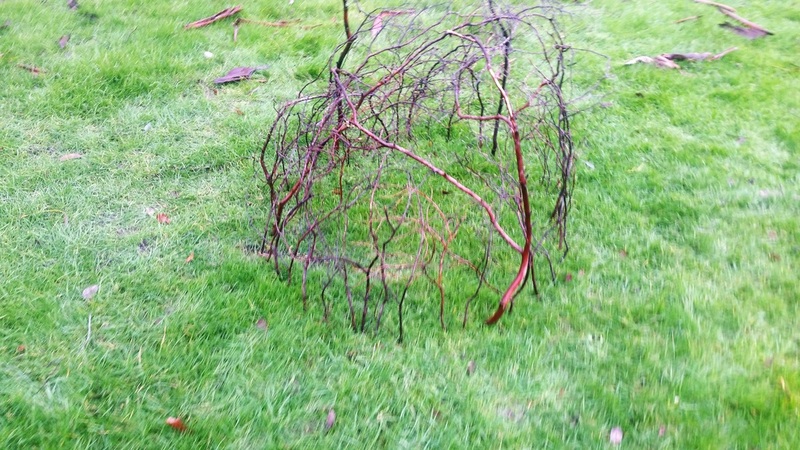 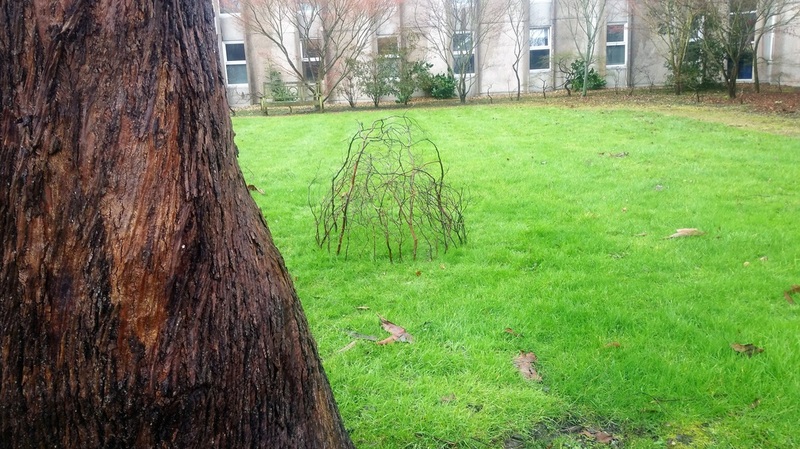 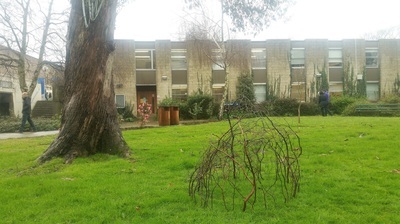 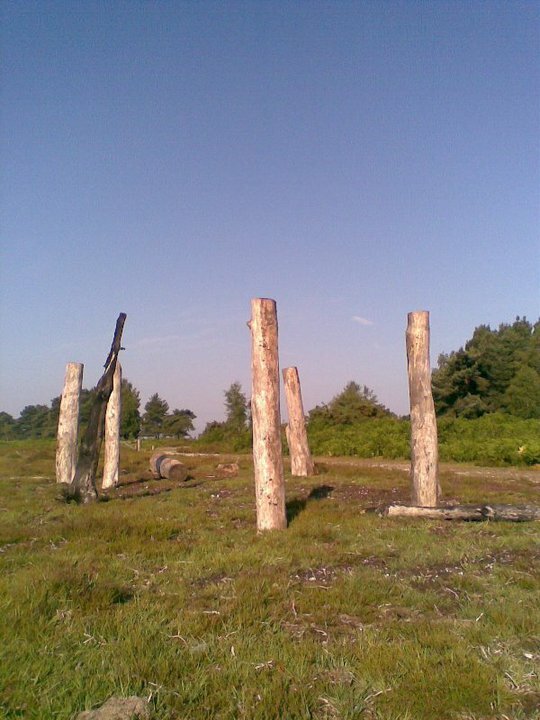 The structure was then deliberately destroyed (a marked difference with the other land art pieces featured here). 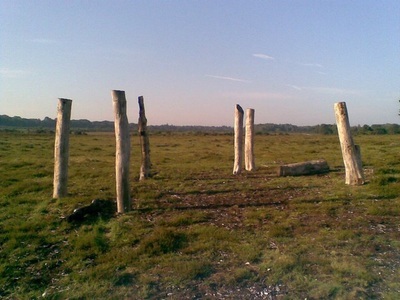 It is this process of construction and destruction which was the work's main gesture. 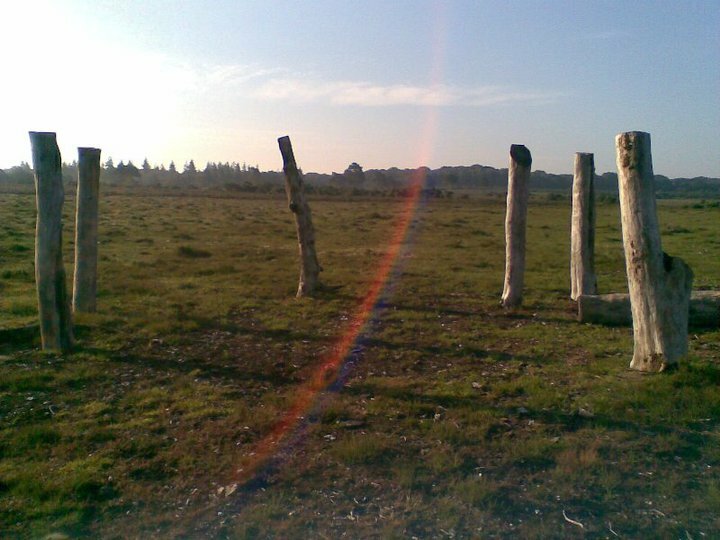 During a solitary early morning walk, I came across a pile of seven tree trunks. 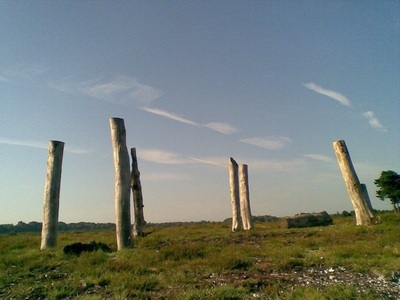 Their weathered texture, and the fact there were no stumps in the vicinity, suggested they had been felled a long time ago, and possibly somewhere else. 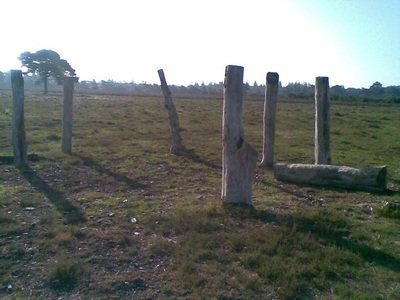 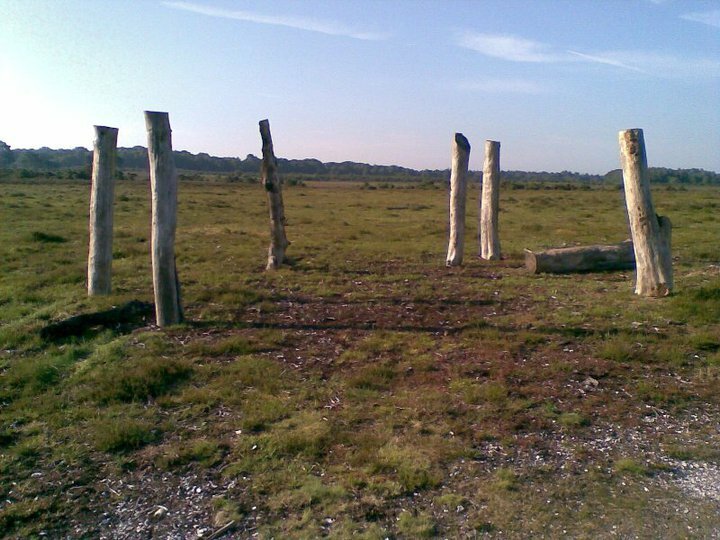 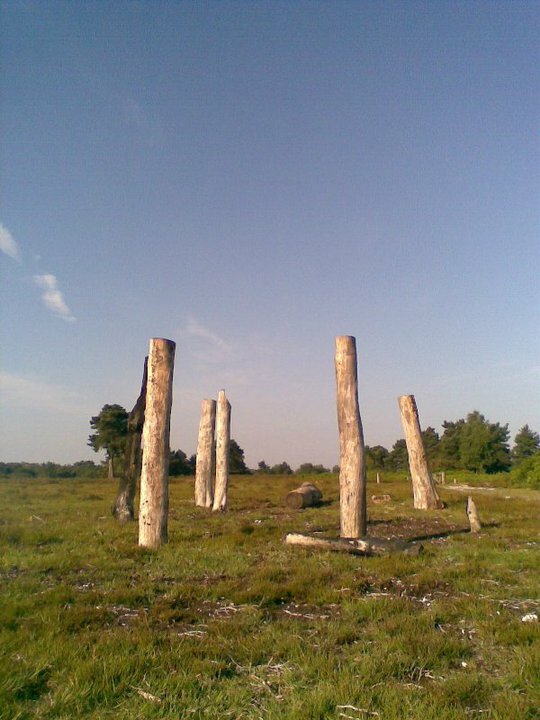 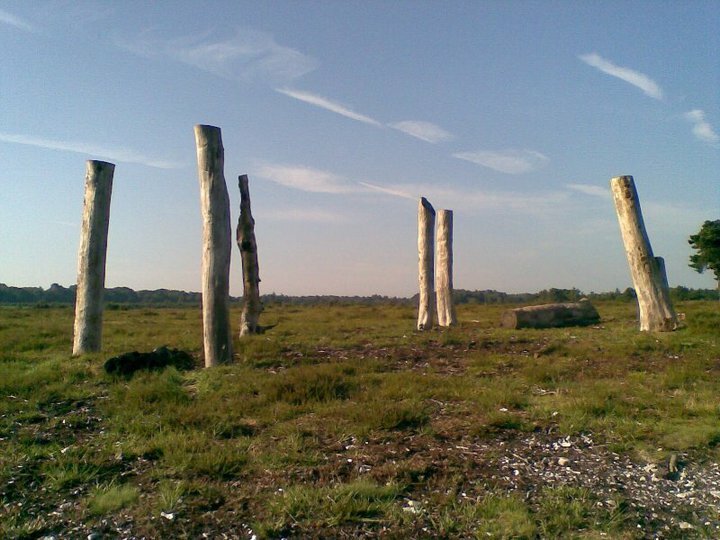 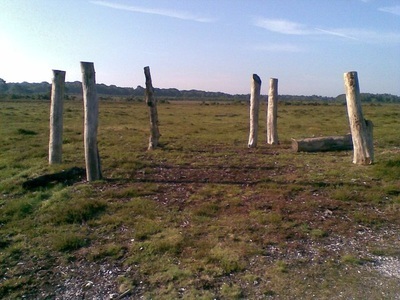 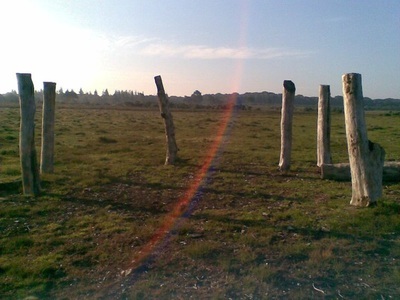 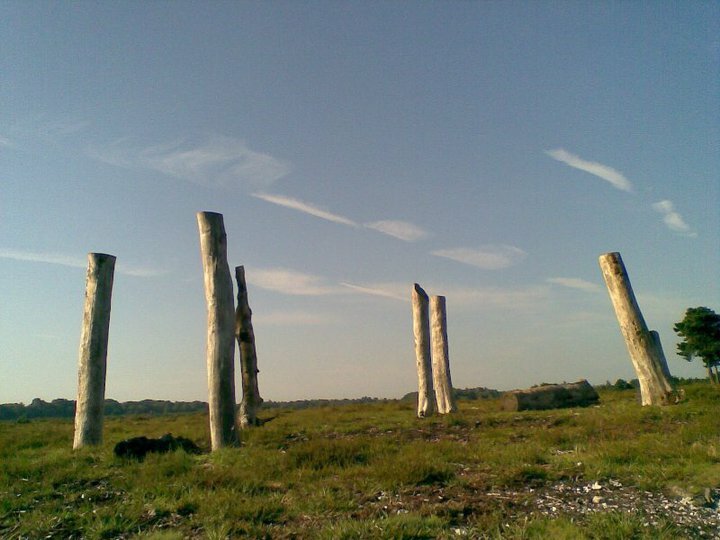 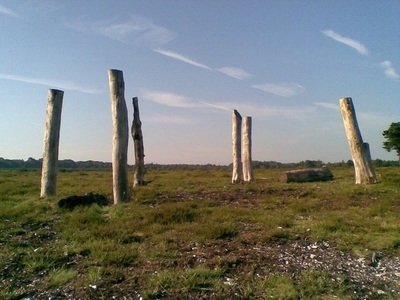 I was drawn to their incongruity within the landscape, emphasising it by erecting six of them in a quasi-circular formation; a new New Forest made up of monumentally upright, dead tree stumps. 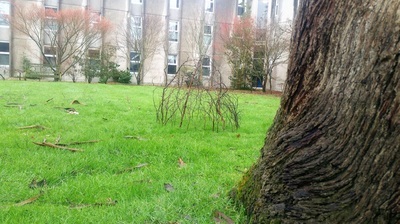 Again, I was walking by myself when I made this unplanned 'land piece'. I selected seven pebbles from the beach for their interesting texture, colour, or other features. 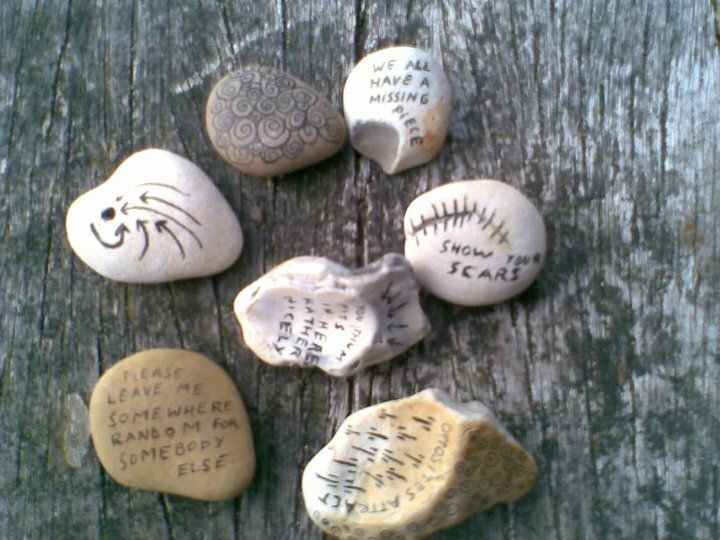 Using a biro I inscribed them with designs and/or texts which drew attention to their idiosyncrasies. 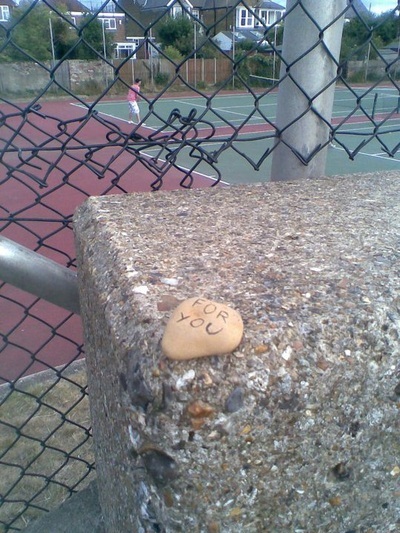 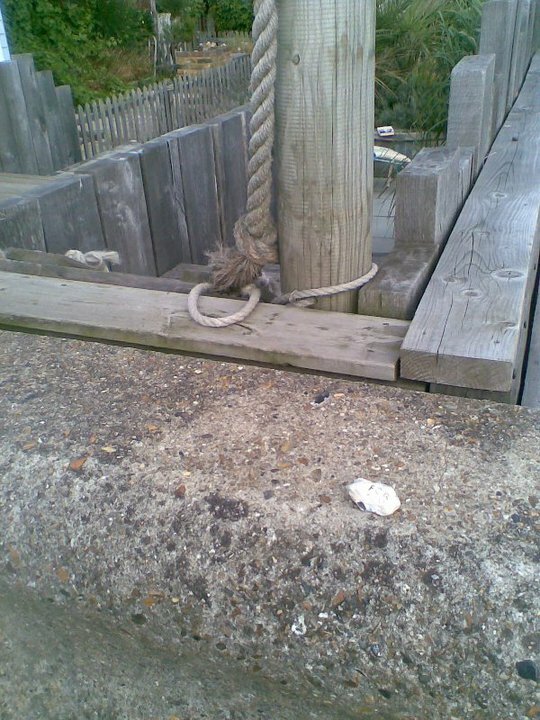 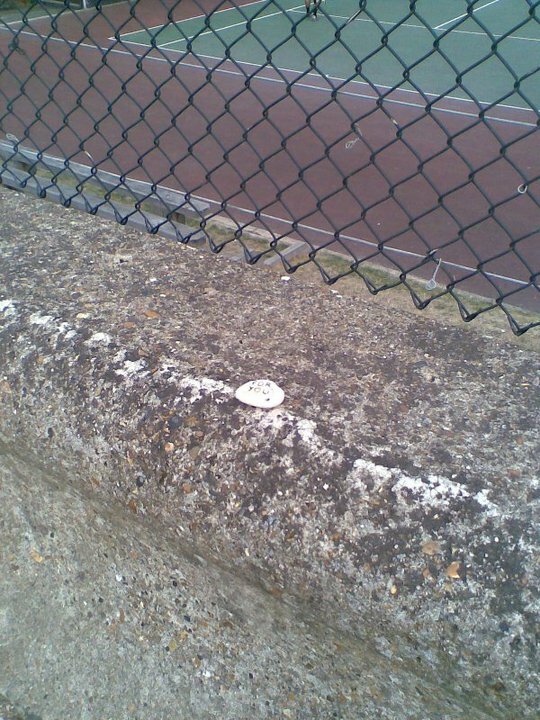 I then left them behind in different places along the seafront for people to find (having written “for you” on the reverse). 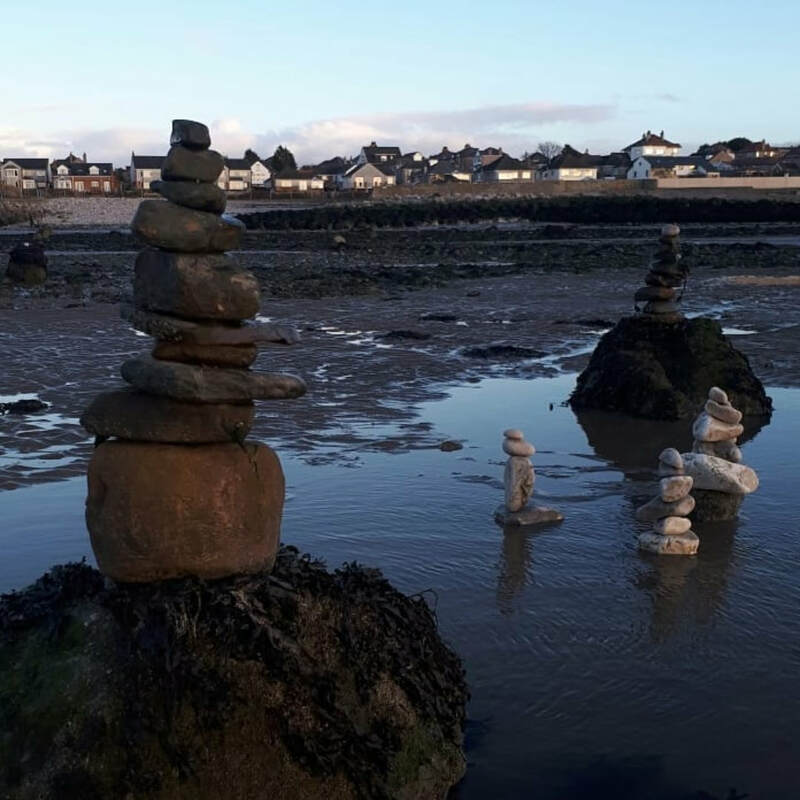 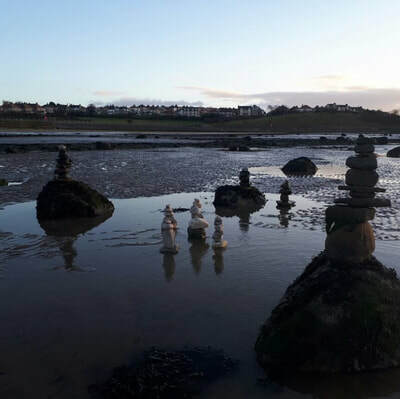 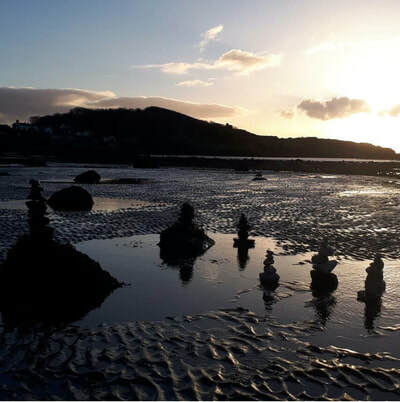 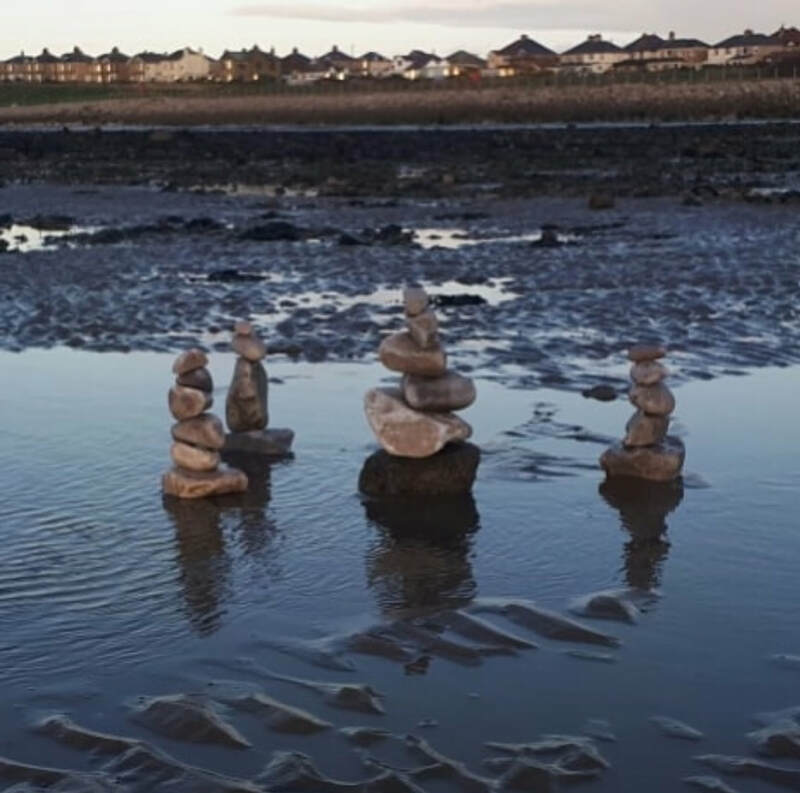 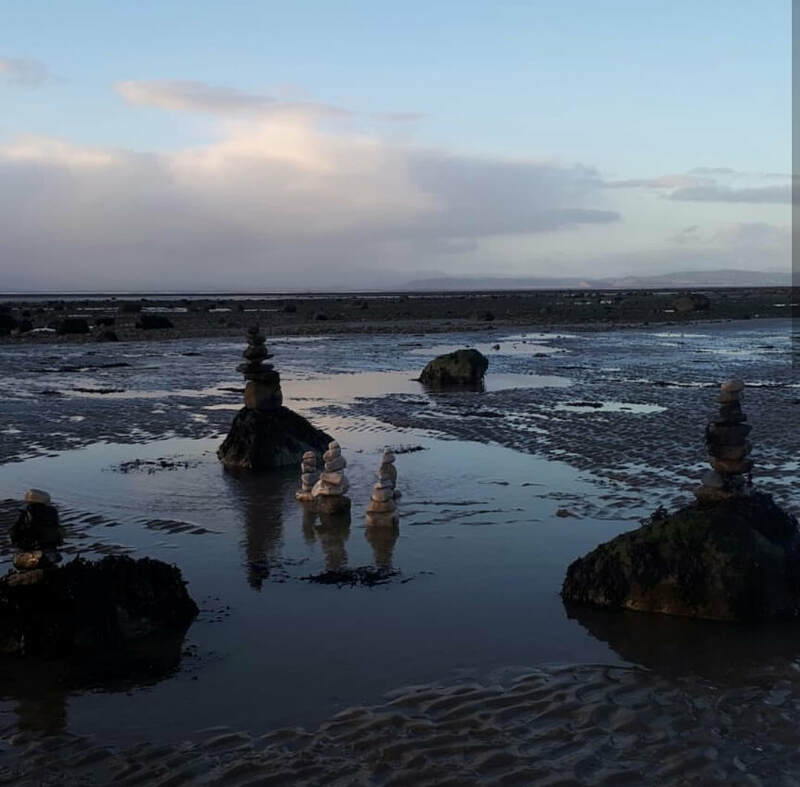 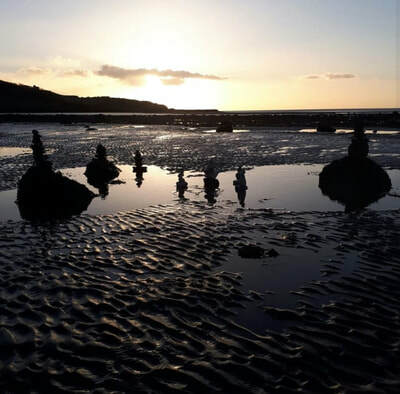 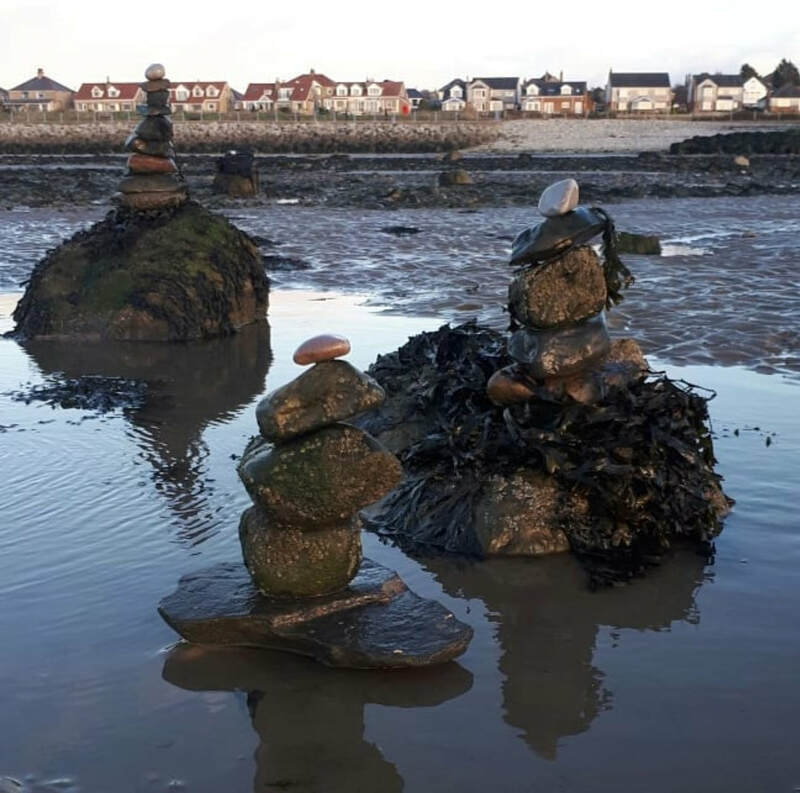 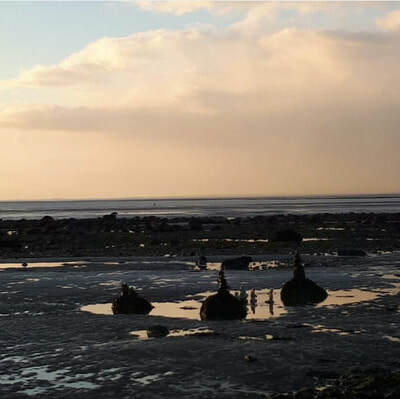 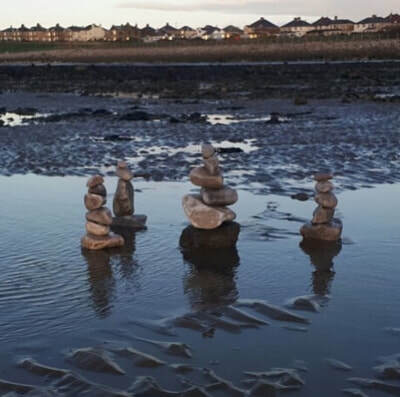 The piece's title is a play on Accidental Collective's performance Pebbles to the Pier, which was created specifically for Herne Bay (only a few miles further down the coast). Earth Movements: A, B, C.
This piece involved the planned and cross-border movement of earth between three different countries. 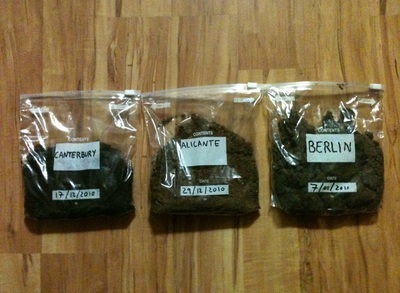 The “A, B, C” in its title relates to the locations where the soil was taken from: Alicante, Berlin and Canterbury. 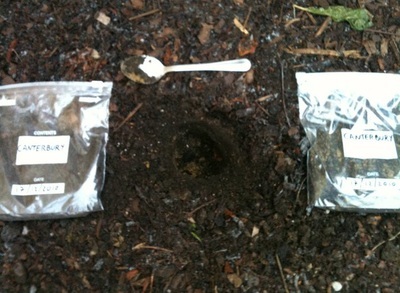 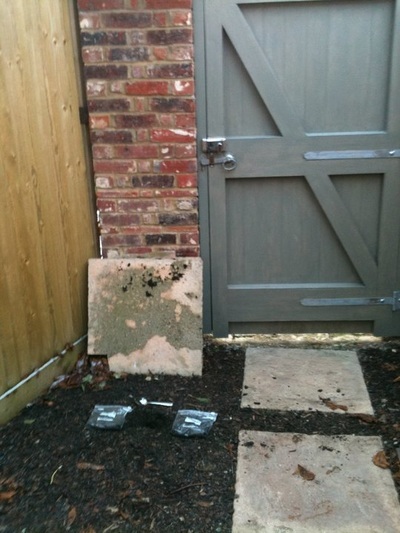 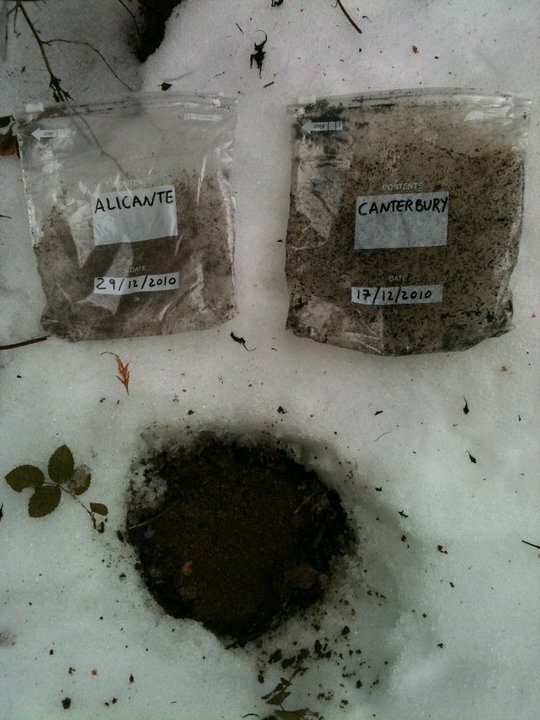 On the 17th December 2010 I dug a hole in my back garden in Canterbury, putting the earth collected into two sealed bags. 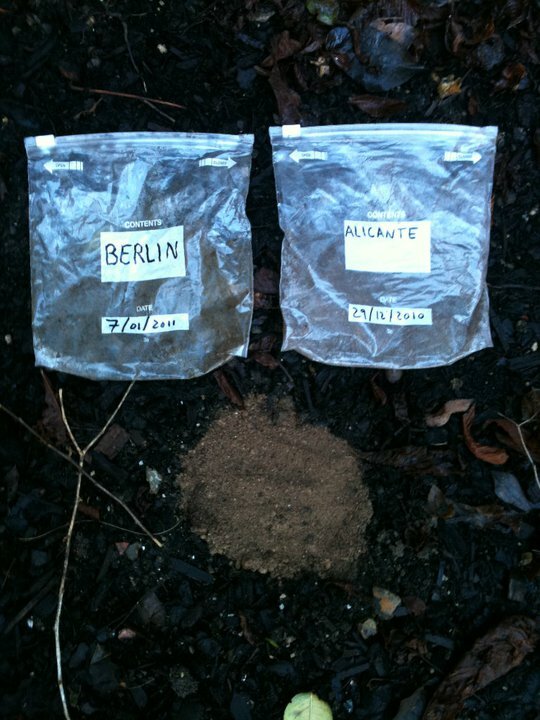 I took these samples with me to Spain and Germany, where I repeated the same action on the 17th December 2010 (Alicante) and on the 7th January 2011 (Berlin). 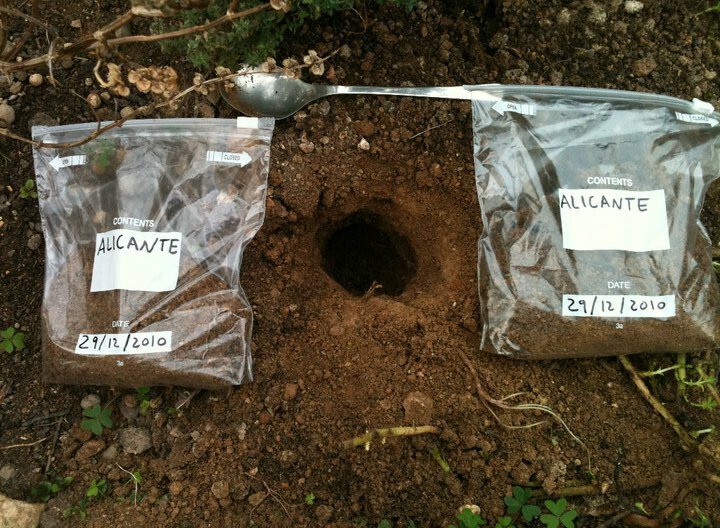 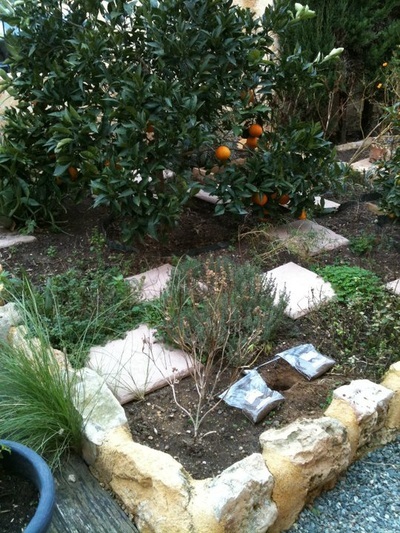 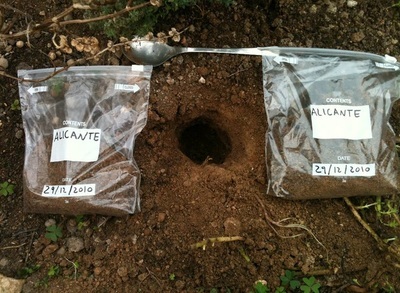 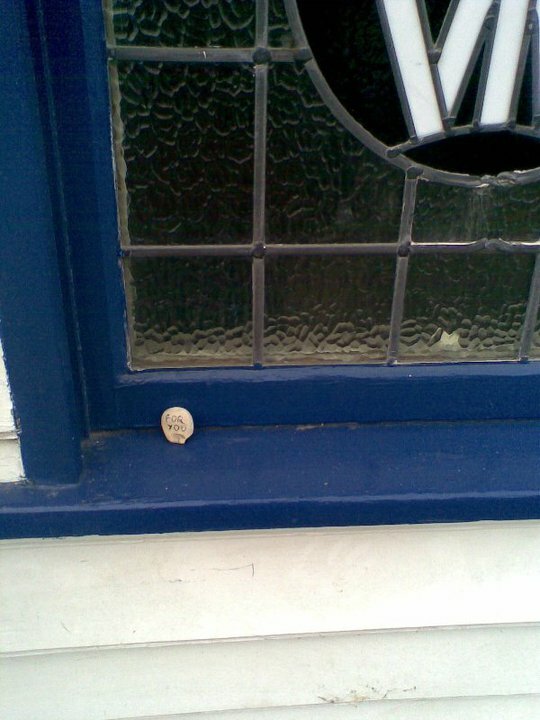 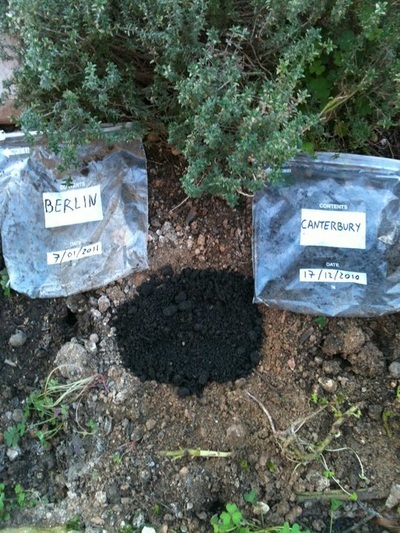 At each location I refilled the holes with soil from the other two places: Alicante & Canterbury in Berlin; Berlin & Canterbury in Alicante; and finally completing the piece on 18th January 2011, Alicante & Berlin in Canterbury. 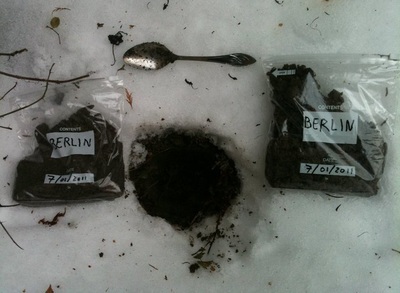 With its movement of earth across borders, the piece sough to explore notions of nationhood and belonging, inadvertently challenging airport security regulations (carrying earth samples in my hand luggage). 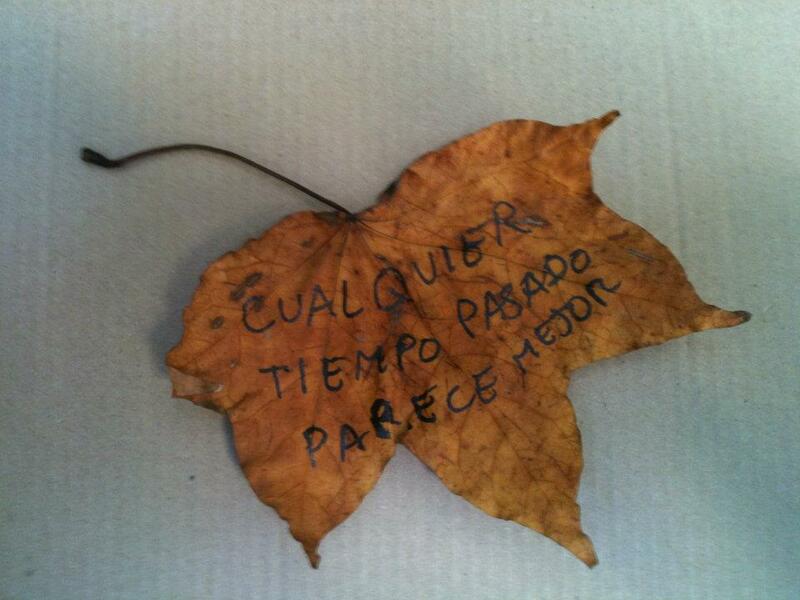 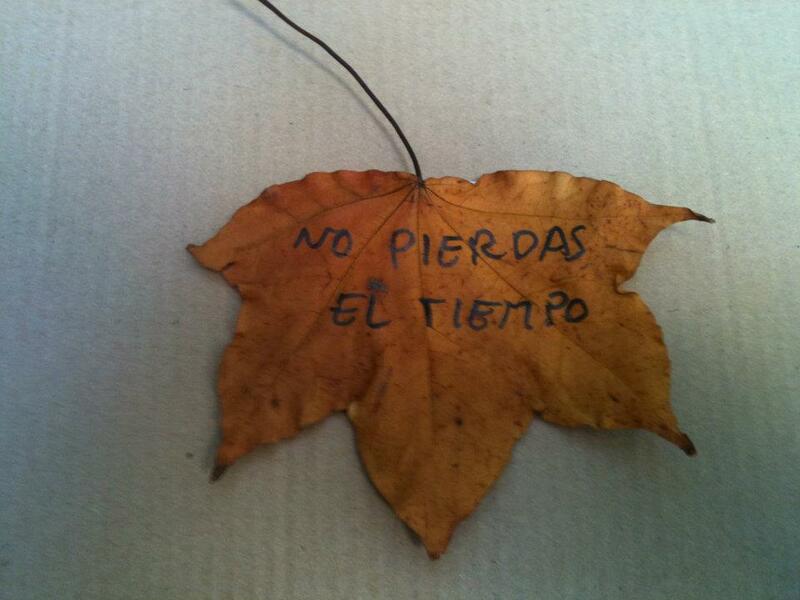 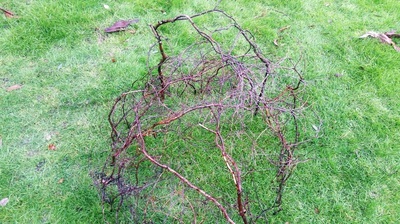 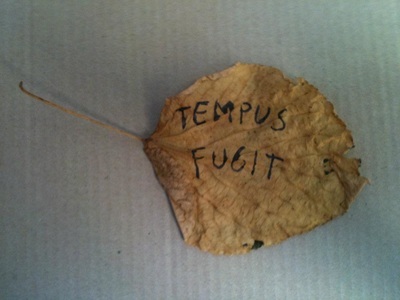 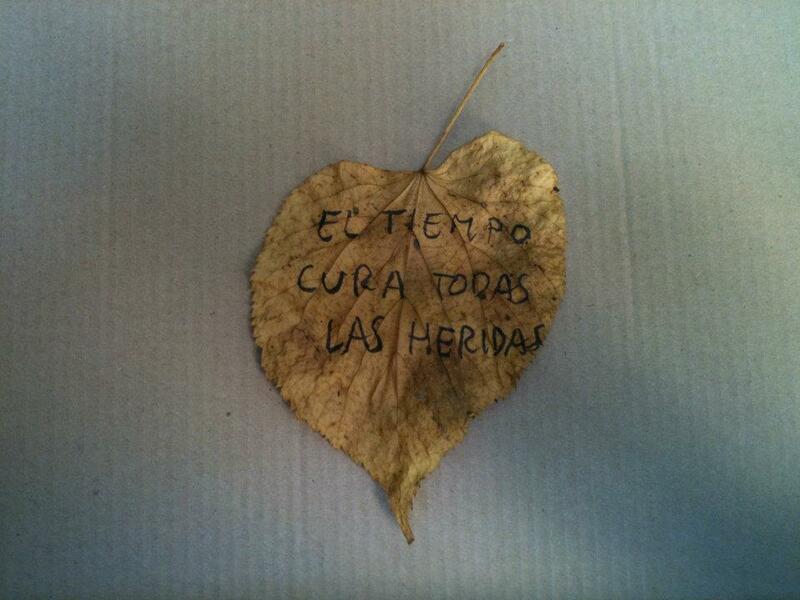 For this piece I collected 124 leaves, some of the first to fall, from Dane John's Garden (Canterbury). On each of them, I wrote common expressions in Spanish. All phrases were about time in some way or another: any time in the past was better, don't lose/waste time, time is gold/money, time flies when you're having fun, time heals all wounds... 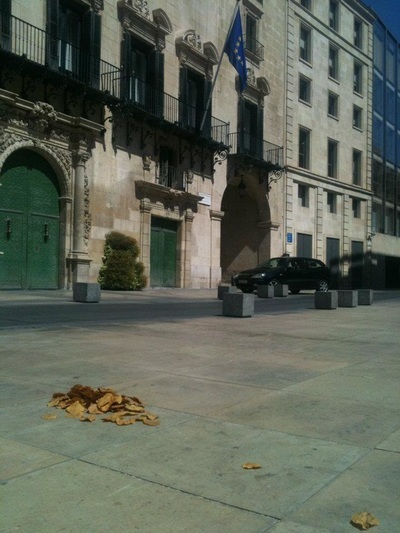 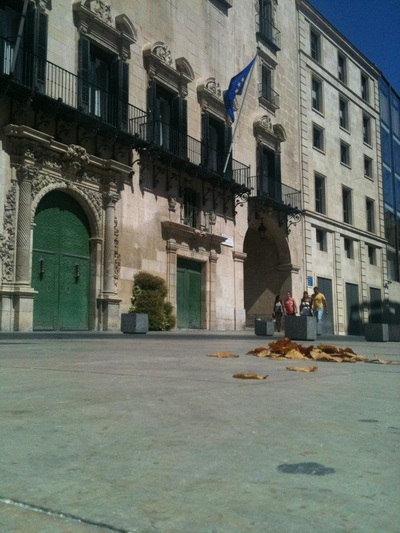 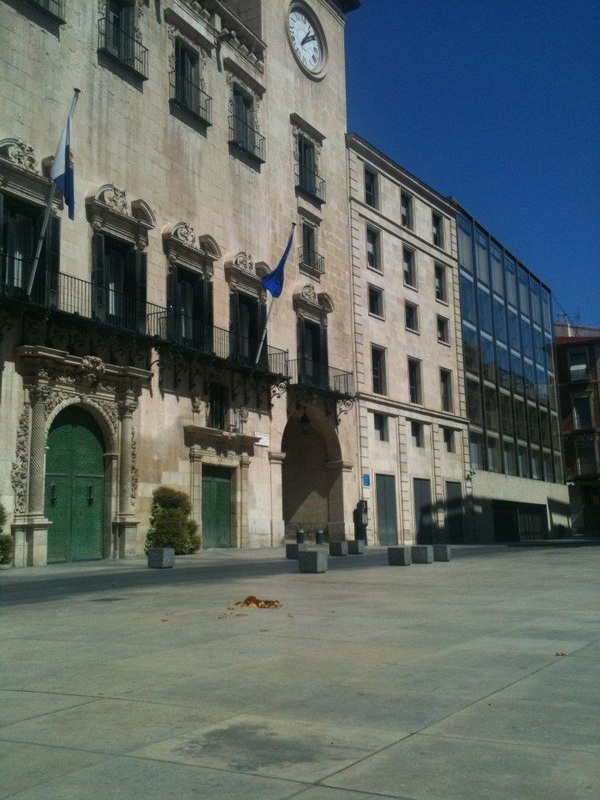 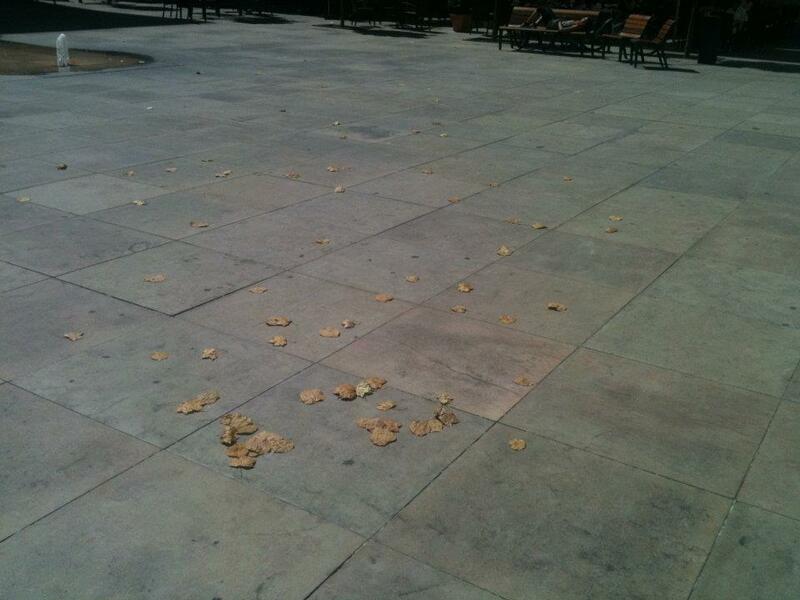 I then took the leaves to Alicante (Spain) and placed them in the town hall square, where people gather to celebrate New Year's Eve. 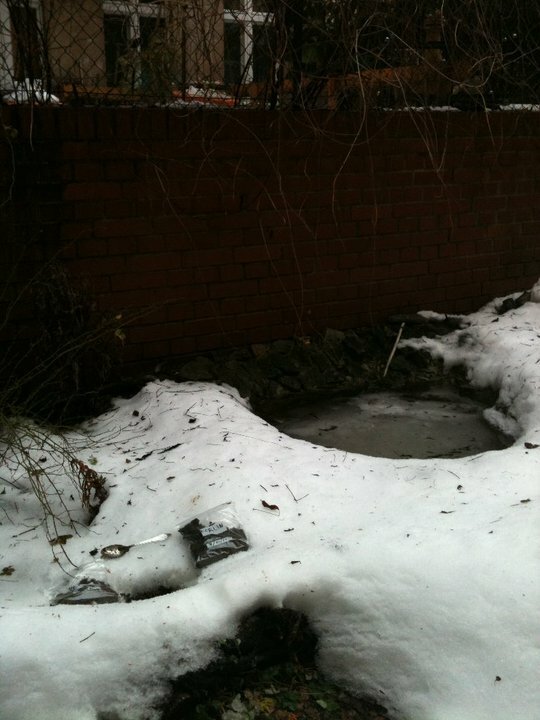 Incidentally, there are no trees nearby. 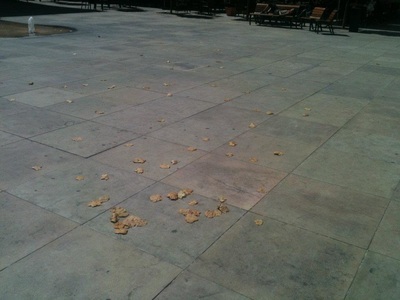 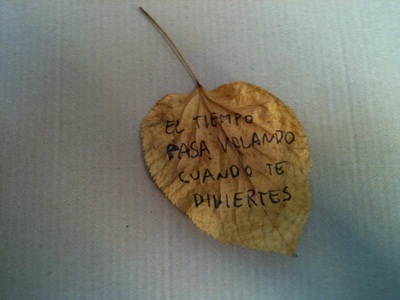 Even if there were, they wouldn't be shedding leaves in September. The piece coincided with the 10th anniversary of 9/11. 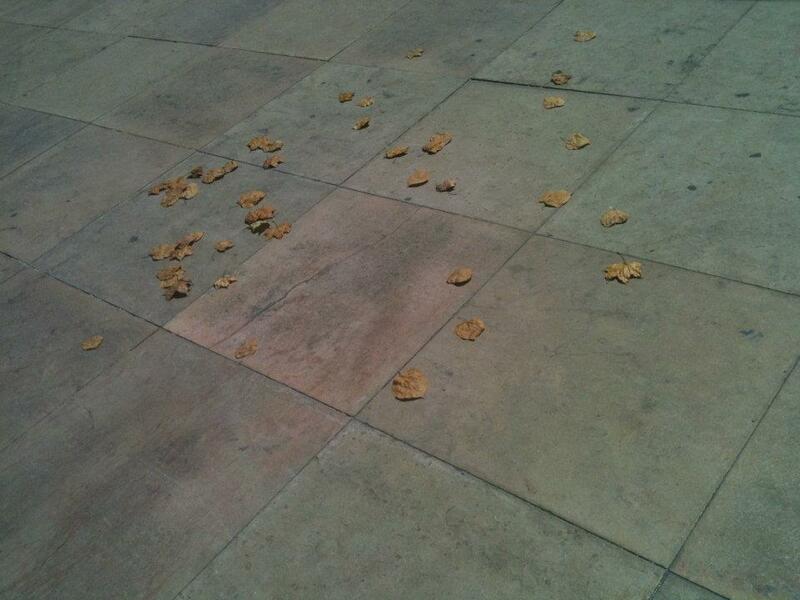 The leaves were placed in a neat pile which the wind began to scatter (passers by also picked up a few). 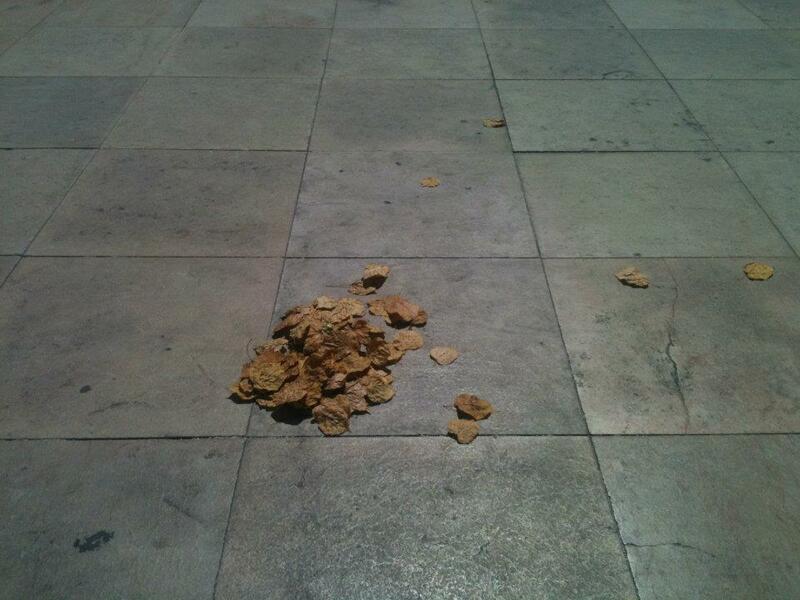 The piece was conceived to last for an unspecified length of time, until the last leave was destroyed or removed. 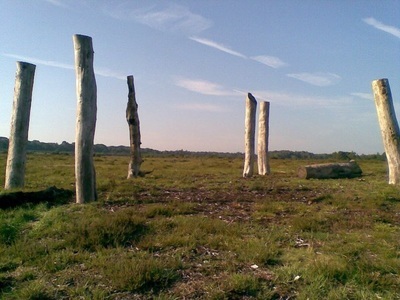 As its title suggests, this 'land piece' addressed the passage of time and the evanescent nature of every moment. 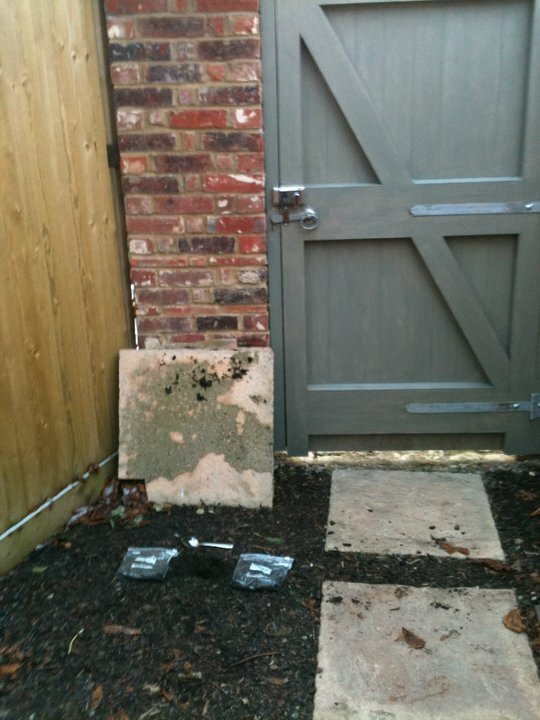 Images courtesy of Lucy Johnson, Phoebe Marsh and Daisy Orton. 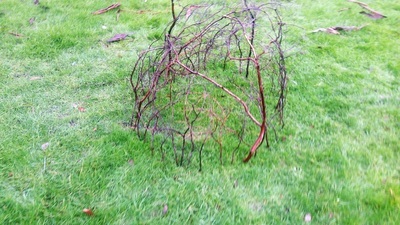 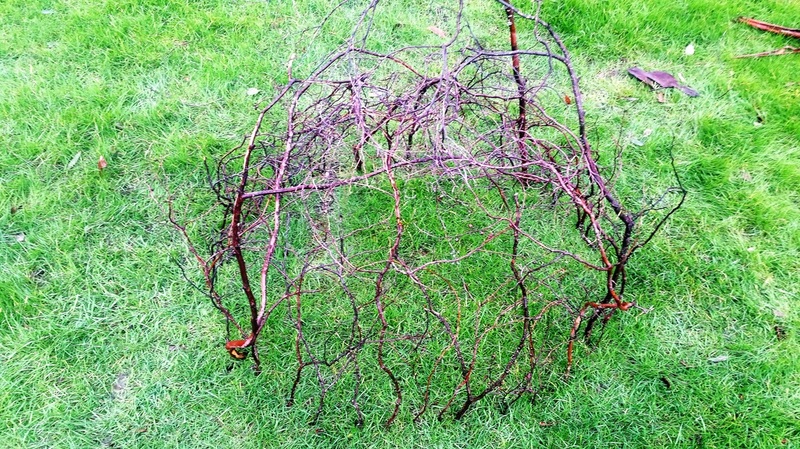 I made this piece to mark my 30th birthday, following a ritual/liminal structure. 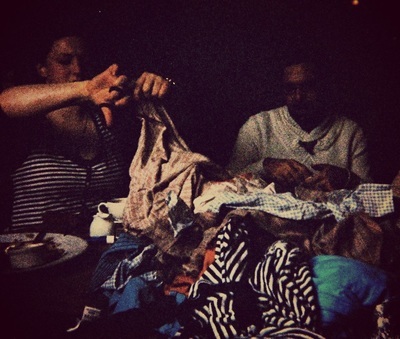 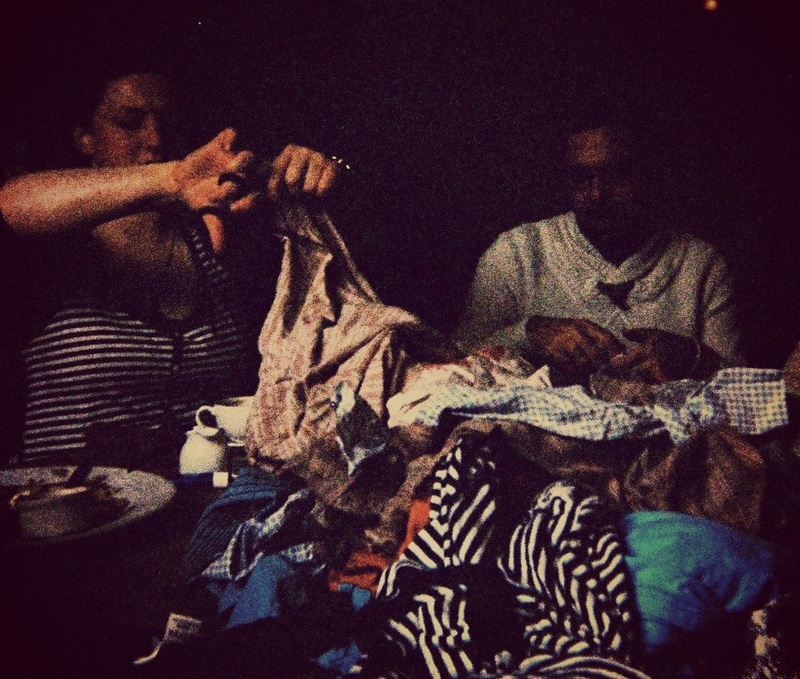 Having cleared out my wardrobe of clothes gathered throughout my 20s, I invited friends to cut them up into strips after a pub lunch, and tie them together as a sort of rag bunting. 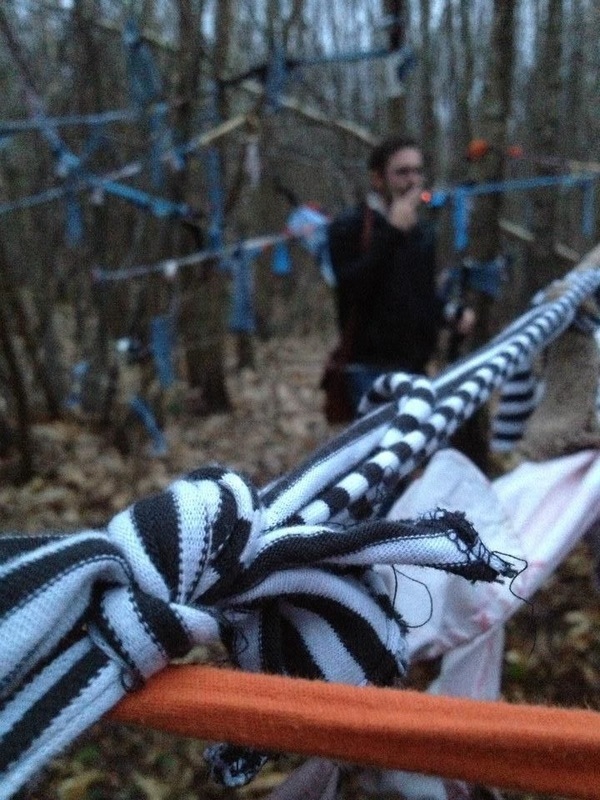 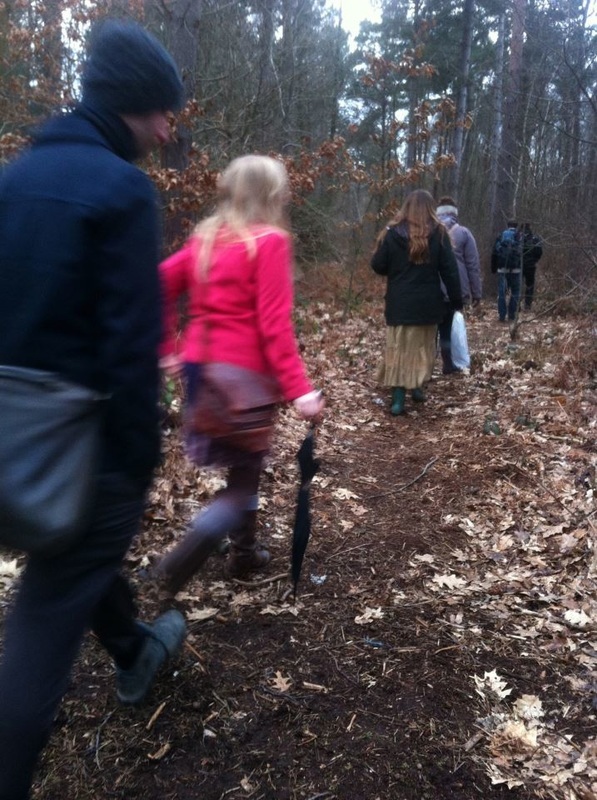 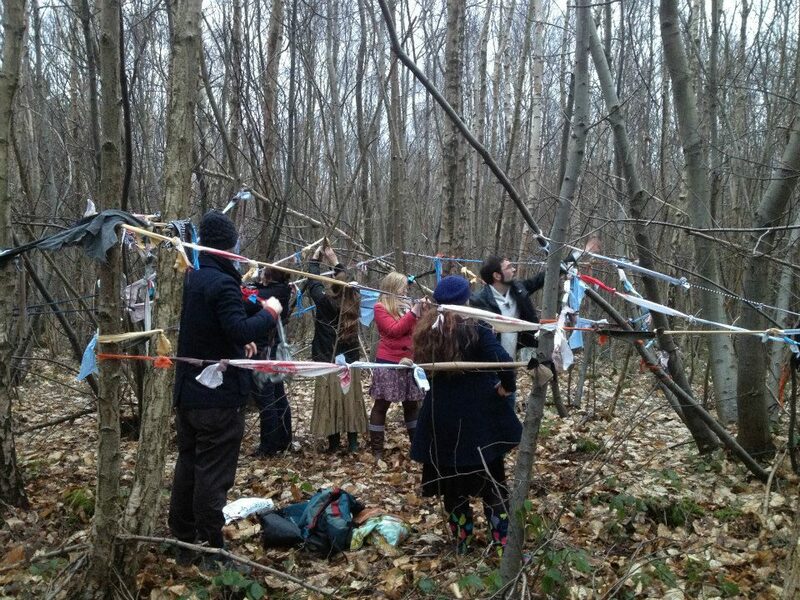 We then walked into the woods where I chose a spot for all of us to place them. Whilst we did this the sun started to set, so that our walk back took place at dusk. 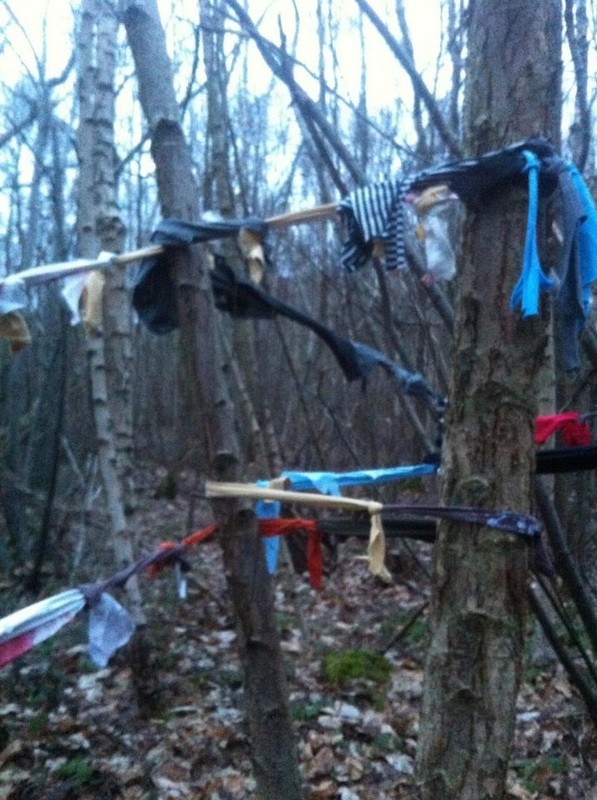 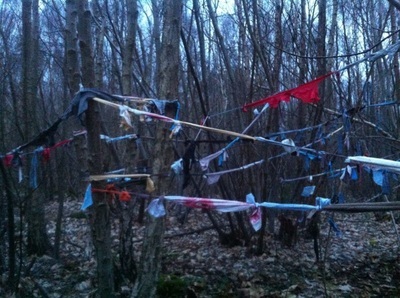 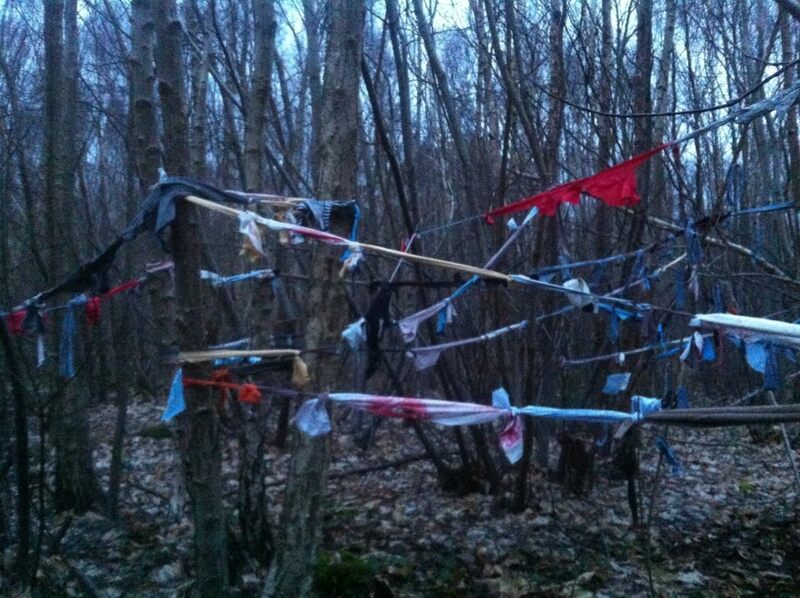 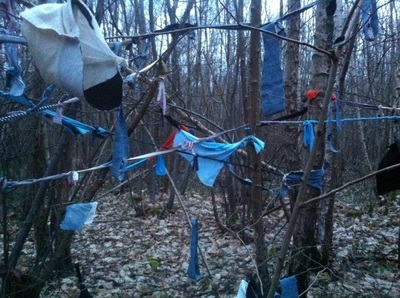 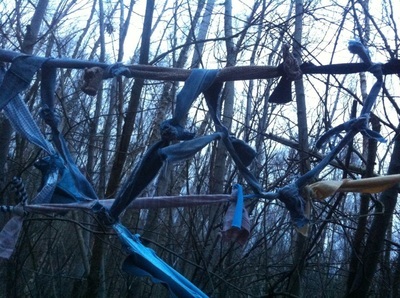 The rag altar was left in the woods as shreds of discarded skin. 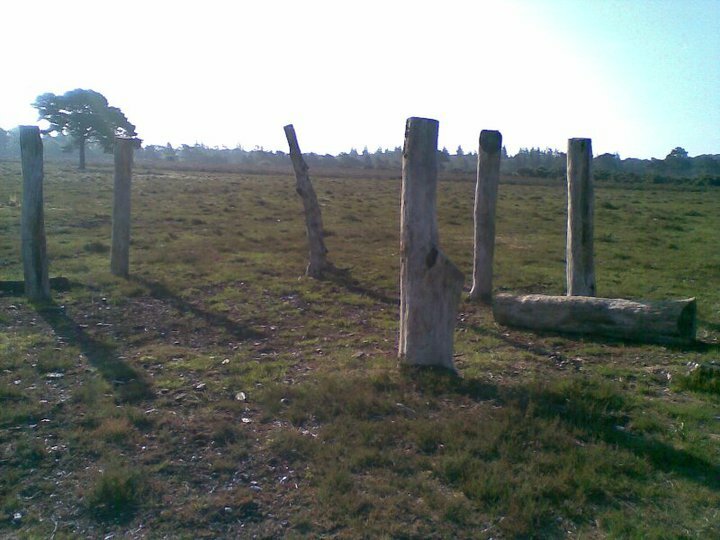 This is the only truly autobiographical 'land piece' to date.